The Marian Apparitions: Divine Intervention or Delusion? Please Note: Each coloured link within the article will lead you to a related topic on a different page of this site. However, while the text is part of the original article, the links are not. The author of this article may or may not agree with the views expressed on those pages, or anything else on this site..
Excerpt from Apparitions of the Virgin Mary:A Protestant Look at a Catholic Phenomenon: by Kenneth R. Samples. “Devotion to the "Blessed Virgin Mary" (as she is commonly called by Catholics) has been a centerpiece of Catholic belief and piety for centuries. However, the last century and a half has seen a dramatic increase in Marian devotion. This resurgence of the "cultus of the Virgin" can be attributed to two primary factors. First, Mary's already exalted status in the church was substantially enhanced by Catholicism's official acceptance of the Marian dogmas known as the Immaculate Conception (1854) and the Assumption (1950). The second force behind Mary's growth in popularity, especially among the laity, is not so much doctrinal as experiential. It is her alleged appearances to people throughout the world. These appearances (called apparitions) have occurred with increasing frequency since the nineteenth century, and have attracted widespread attention. Pope Pius XII, in calling attention to the apparitions, referred to the nineteenth century as the "century of Marian predilection [i.e., preference]." And the present century cannot be far behind: one leading Marian scholar notes that there have been more than 200 reported apparitions since the 1930s alone. With the various shrines dedicated to the particular apparitions attracting millions of pilgrims each year, it is easy to see that this phenomenon is having a substantial impact on the almost one-billion-member Roman Catholic church .... Since this phenomenon is attracting the attention of millions of people throughout the world, it demands careful examination in the light of Scripture. “... Throughout the middle ages countless numbers of supposed supernatural manifestations were reported to the church. These included everything from physical healings (often connected to ancient relics) to statues and crucifixes which were reported to have bled. While many of these unusual occurrences have been discredited or rejected in modern times, apparitions have generally remained popular and credible in the eyes of Catholics. People in the past have reported seeing apparitions of Jesus, various saints, and even the Devil himself. But the most enduring and recognizable apparitions are those of the "Blessed Virgin Mary." 1 The word "Medjugorje" is Croatian for "between the hills." 2 These figures were given to me by Catholic journalist Gabriel Meyer. He is based in Medjugorje and writes for the National Catholic Register and Catholic Twin Circle. 3 Gabriel Meyer, A Portrait of Medjugorje (Studio City, CA: Twin Circle Publishing Company, 1990), 19. 4 As cited in Mary Craig, Spark From Heaven: The Mystery of the Madonna of Medjugorje (Notre Dame, ID: Ave Maria Press, 1988), 16. This quote comes from an interview transcript for the BBC Everyman/Westernhanger film, The Madonna of Medjugorje. 5 Svetozar Kraljevic, The Apparitions of Our Lady at Medjugorje, ed. Michael Scanlan (Chicago: Franciscan Herald Press, 1984), 13. 7 As cited in Rene Laurentin and Rene Lejeune, Messages and Teachings of Mary at Medjugorje (Milford, OH: The Riechle Foundation, 1988), 150. 8 Rene Laurentin and Ljudevit Rupcic, Is the Virgin Mary Appearing at Medjugorje? (Gaithersburg, MD: The Word Among Us Press, 1984), 26-27. APART FROM WALSINGHAM in my distant Anglican days, the Marian shrines had never really interested me. I was of course aware of some of the most important ones—Lourdes, Fatima, and more recently Medjugorje—, and knew that while many people (the vast majority being Roman Catholics, of course) considered these apparitions a direct sign from Heaven, others (mainly Protestant) considered them some kind of hallucination or even demonic delusion. Not being a member of the Roman Catholic Church, I felt under no obligation or inclination to give them much thought. But learning that an Orthodox priest had been on pilgrimage to Lourdes, and that the wife of another Orthodox priest organized an annual visit by a group of Orthodox women to Lourdes, my interest was aroused, and I began to feel a strong compulsion to take a closer look at the Marian apparitions and their shrines. Books by Roman Catholic authors were the main source of my information concerning the apparitions and the shrines. I was extremely surprised to find how numerous they were, and in the end confined myself to just fifteen, with a special look at the Miraculous Medal, La Salette, Lourdes, Fatima, Garabandal, Zeitoun, Medjugorje, Hriushiw. Walsingham I did not consider at all, since it seems to be in a somewhat different category, in that its raison d'etre is a straightforward honouring of the mystery of the Incarnation, with the Son of God as the central figure. The staunchest Protestant could hardly quarrel with that intention, however much he might disapprove of the particular way in which the honour is rendered. The more I read the more convinced I became that the whole issue was considerably more complex than a straight choice between Divine revelation on the one hand and demonic delusion on the other. Several other factors seemed to play a part in varying degrees of significance at different shrines—psychological factors, the question of ecclesiastical manipulation and papal involvement, nationalist and political elements, the presence of something much older than Christianity, namely the worship of the goddess, and finally, the possibility of a link-up with New Age syncretism and neo-paganism. One aspect that particularly interested me, and to which little attention seems to have been given, was the question of solar phenomena witnessed at most of the apparition sites from Fatima onwards. I had no idea that this would lead me into the realm of UFOs! Any conclusion that I finally reached—and sometimes there seemed to be more questions than answers, and many loose ends which did not tie up, are purely the result of my own personal reasonings. It may well be that those who are far more competent to judge these matters than I am would interpret things in a different light. All along it was more an exploration than anything else. When I began, I really had no idea where it would eventually lead. A brief resume of the shrines mentioned above may be of help in giving a general background. 1) Around 1295, Duns Scotus, a Scottish Franciscan at Oxford, was defending the Immaculate Conception against Thomas Aquinas and the Dominicans. By 1708, the Feast of the Immaculate Conception was declared to be a universal holy day of obligation. In 1830, Catherine Laboure, a young nun in Paris, had a vision of the so-called Miraculous Medal. She was prone to visions, having already seen the heart of St Vincent, Our Lord in the Blessed Sacrament, and Christ the King. Being greatly desirous of seeing the Blessed Virgin also, she requested the intercession of St Vincent and her wish was granted. A small child in white (her guardian) led her to the convent chapel late at night, where she saw, spoke with, and touched the Lady. Later in the year, the Lady, dressed in white, stood in the chapel with a serpent beneath her feet, surrounded by an oval frame with the words, "Mary, conceived without sin, pray for us, who have recourse to you." A voice instructed Catherine to have a medal struck, which would give great graces to the wearers. The reverse of the Medal was to show an "M," surmounted by a cross, together with the hearts of Jesus and Mary. Catherine continued to hear the voice of the Lady in her prayers. The Medal was a huge success, and led to an increased confidence in the prayers of the Virgin, the Mediatrix of all graces, and a growing popular demand to have the Immaculate Conception made an official dogma. While wearing the Medal to humour a Catholic friend, the Jewish convert, later Fr Marie-Alphonse Ratisbone was converted in 1842 after seeing a vision of the Virgin of the Miraculous Medal. (His brother was already a Roman Catholic priest). He devoted the rest of his life to the conversion of the Jews and built the Ecce Homo Convent of the Sisters of Zion in the Via Dolorosa in Jerusalem. 2) In 1842 at La Salette, in France, two cowherds, an eleven year old boy, Maximin, and a fourteen year old girl, Melanie, saw a sudden flash of light from which a lady appeared, dressed in white and gold, with a cap of roses on her head. She was surrounded by a brilliant light and was weeping. The Lady complained that Sunday was being desecrated and the peasants were blaspheming the saints in swearing. (The Cure d'Ars and other clergy were regularly complaining about these very sins in their sermons). If there was no amendment, there would be great disasters—the harvest would fail and people would starve—as the Lady could no longer restrain her Son from inflicting punishment. The discourse of the apparition was very similar to a "Leter [sic] Fallen from Heaven" circulating at the time. The parish priest declared the Lady to be the Blessed Virgin; the apparitions were later approved by the Bishop of Grenoble, and pilgrimages began. Melanie became a nun and continued to receive visions and revelations. Maximin tried unsuccessfully to become a priest and was always in debt. 3) In 1854, the Immaculate Conception became an official article of faith in the Roman Catholic Church. Just four years later, in 1858, a series of visions took place from February 11th to July 16th, which would result in the establishment of the most famous of Marian shrines. At the grotto of Massabielle at Lourdes, the fourteen year old Bernadette Soubirous saw "something white in the shape of a girl." Under questioning she elaborated this to a "pretty young girl in white dress and veil, with a blue sash and a yellow rose on each foot." Later still, she said the vision most resembled "the Blessed Virgin in the parish church for the clothes and the face ... but alive and surrounded by light." The Lady, who carried a rosary over her arm, spoke in the local dialect, in a very polite manner, and, called for penance. Bernadette was given three "secrets," asked to pray for the conversion of sinners and told that the Lady promised to make her happy not in this world but in the next. The apparition asked for a procession and a chapel, and instructed Bernadette to dig for a spring, which was already known to exist. Bernadette recited the rosary and went into trances. The Lady announced her name as "I am the Immaculate Conception," thereby confirming the recently defined dogma. In the following October, the ecclesiastical authorities took charge, the results being that the apparitions were confirmed as of the Blessed Virgin, the cult of Our Lady of Lourdes was authorized, and plans were put in motion for building a sanctuary. In 1933, Bernadette was canonized. 4) In August 1879, fifteen people aged from six to seventy-five years old saw an apparition at the south gable of the parish church at Knock, in Ireland. The vision was in the form of a tableau, with an altar on which stood a Lamb, with angels hovering overhead, and three figures—the Virgin crowned, St Joseph and St John the Evangelist dressed as a bishop and apparently preaching. The figures were a little way out from the church wall and about two feet above the ground. They were motionless, except that from time to time they receded and then moved out again. No word was spoken. Some of the witnesses remained for up to two hours in the pouring rain, reciting the rosary. This is the only known apparition of the Lamb. An international runway was eventually built in anticipation of huge numbers of pilgrims, but somehow the shrine never achieved great popularity. In 1954 Pope Plus XII blessed the Knock banner at St Peter's and gave permission for the crowning of Our Lady of Knock. In 1960, John XXIII presented a blessed candle, and in 1967 Paul VI renewed indulgences to pilgrims and those connected with the shrine. John Paul II visited Knock in the centenary year, raised the church to the status of a basilica, and presented the Golden Rose. 5) In 1917, at Cova da Iria, near the village of Fatima in Portugal, three cousins who were all young peasant shepherds—Lucia, aged ten, Francisco aged nine, and Jacinta aged seven—saw flashes like lightning after which "a pretty little lady" appeared above a tree, who said she had come "from Heaven." The children were told to come to the same spot on the thirteenth day of the month for the next six months, then they would be told who the Lady was and what she wanted. In reply to Lucia's questions, she said that Lucia and Jacinta would go to Heaven, also Francisco, but he would "have to say many rosaries." One little friend of the children who had recently died was in Heaven, but another was in Purgatory "till the end of the world." The boy Francisco could not see the vision at first and never heard anything. Jacinta both saw and heard, but never spoke to the Lady. On other occasions they were told to say the rosary and pray especially to be "saved from the fires of hell." Lucia was told "secrets" and saw a terrifying vision of bell. The Lady promised to work a miracle in October. Lucia was beaten by her mother for telling lies, and the local atheist administrator interrogated the children and imprisoned them for two days, but they continued to stick to their story. On October 13th, a day of pouring rain, a crowd of seventy thousand people assembled at the Cova, expecting the promised miracle. According to a Roman Catholic priest, they were highly excited, kneeling, weeping and praying. The Lady appeared, announcing that she was Our Lady of the Rosary and that the war would end that day (in fact it did not end till thirteen months later). Then she disappeared and the famous "miracle of the sun" took place. The rain had ceased, and when Lucia cried out "Look at the sun!" (in which she claimed to see in turn Our Lady of Sorrows, Our Lady of Mount Carmel, St Joseph with the Holy Child, and Our Lord), the crowd stared at the sun which appeared to spin, give out coloured rays, zigzag from east to west, fall towards the earth—making those present fear that it was the end of the world,—and return to its place. This was not seen by everyone in the crowd, although some people ten kilometres from Fatima saw it. Other reported solar phenomena, both during the period of the apparitions and afterwards, were a sun casting rainbow-coloured light over everything, a "luminous globe," a "night-time star" and a "rain of flowers" (similar to the "rain of roses" following the death of Therese of Lisieux, the Little Flower). Like Melanie of La Salette and Bernadette of Lourdes, Lucia became a nun, and like Melanie she continued to have visions and revelations. In 1925, the Lady appeared to her with the Child and the message that devotion to the Immaculate Heart should be spread. The following year, the Infant appeared alone. Then in 1929, the Lady commanded that Russia should be consecrated to the Immaculate Heart—this was the first mention of Russia. In 1937, Lucia wrote a detailed account of the apparitions, which grew in the telling and included previous appearances of an Angel to the children. In 1915, he had appeared "like a person wrapped in a sheet;" in 1916, as a youth of fifteen or sixteen years old, "whiter than snow," who announced himself as the "Angel of Peace," and instructed them to pray for unbelievers with their foreheads touching the ground. Later in 1916 he told them he was Portugal's guardian angel, that they must pray and make a sacrifice of everything they did (similar to Therese of Lisieux) in order for peace to come, and that "the most holy Hearts of Jesus and Mary" had plans for them. Later still in 1916, the angel appeared "like a cloud in human form, whiter than snow, almost transparent," and gave the children Holy Communion. In 1941-42, Lucia revealed still more, writing a description of her terrifying vision of hell on July 13th, 1917, in conventional terms of red fire, black demons, screams of pain and despair, and relating that the Lady had warned of a great sign of a night illumined by an unknown light that would signal some terrible Divine punishment which could only be averted by the consecration of Russia to the Immaculate Heart. This was done in 1952 by Pope Pius XII, as the conversion of Russia was promised unconditionally. The Roman Catholic priest Fr Martindale somewhat sceptically pointed out that "the conversion of the world was not unconditionally attached to Calvary itself"! Pope John Paul II repeated the consecration in 1981. In 1960, Pope John II opened the sealed envelope containing the Third Secret of Fatima, but refused to reveal it; it remains unrevealed. The Second Vatican Council officially recognized the apparitions and the cult of Our Lady of Fatima. 6) At Garabandal, in Spain, a series of apparitions took place between 1961 and 1965, during which time the visionaries, four girls aged from ten to twelve years, claimed to have been favoured with two thousand appearances of the Virgin and the Archangel Michael. On June 18th, while they were playing, after a flash of light and the sound of "thunder," the Archangel Michael made the first of his nine appearances that month. The girls described him as about nine years old, dressed in blue with rose-coloured wings, swarthy skinned, dark eyed, with well kept hands and nails. The following month, watched by crowds of people, the girls went into a two hour trance. The next day, during another trance, they saw the Virgin in white and blue, with a crown of stars. She spoke to them about hay-making and everyday things. Sometimes she appeared with the Baby, which the girls were allowed to hold. The trances lasted from a few minutes to nine hours, and while in trance the girls would give the Virgin holy objects—rosaries, medals and crucifixes—to kiss for the pilgrims. A large crowd saw the Host appear on Conchita's tongue when the Archangel Michael gave her Communion. This "miracle" had been announced in advance. The messages contained warnings of great punishments, which could only be averted by many sacrifices and penances. The girls were told to visit the Blessed Sacrament often, and try to be perfect. There would be a great miracle at Garabandal in the future, which would be seen by the Pope and Padre Pio (who, of course, died without doing so), and Russia would be converted as a result of the miracle. A young Jesuit priest saw a "vision" of the miracle, pronounced that day the happiest day of his life, and promptly died the next day. Padre Pio is said to have believed in the apparitions. The local hierarchy did not, and at one stage, Conchita confessed, under lengthy interrogation, to having doubts about her visions. The present bishop, appointed in 1991, is asking Rome to re-open the case. Some people have seen the sun dance, and a red star with a tail like fire was seen during the apparitions. Once the Virgin came in a mysterious cloud of "fire." 7) In many ways the appearances over the Coptic Church of St Mary at Zeitoun, Cairo, were the most interesting and the most credible. They concerned not the Roman Church, but the Coptic Church, and Coptic bishops, including the Coptic Patriarch's representative, were among the millions of Christians, Muslims, Jews and non-believers, who many times witnessed the apparitions over a period of three years, from 1968-1971. The Coptic Church recognized the apparitions as true appearances of the Blessed Virgin Mary, as did the Coptic Catholic Church, the Greek Catholic Church, and the then Head of the Evangelical Church and Speaker on behalf of all the Protestant Churches of Egypt. Even the Egyptian Government Director of General Information and Complaints Department submitted a report to his superior stating that it was "an undeniable fact that the Blessed Virgin Mary has been appearing on the Coptic Orthodox Church at Zeitoun ..." The vision maintained a complete silence. There were no threats of punishment, pushing of Latin dogmas and practices, apocalyptic warnings and no trances. The apparition appeared on the domes of the church for up to two hours or more at a time, always at night, but not every night and not at regular times. The Lady appeared in glittering light—so bright that her features could not be clearly seen—which streamed across the church. She was invariably preceded or accompanied by luminous "doves," "strange bird-like creatures made of light," which did not flap their wings but glided. The figure moved across the domes bowing and greeting the enormous crowds, estimated at times to be as many as 250,000 people. Sometimes she blessed them or held out an olive branch. The Patriarch's representative described her as "very quiet, full of glory." Occasionally she was seen holding the Child, or as part of the Holy Family. All prayed in their own way—Moslems reciting the Koran on their prayer mats, Greeks saying prayers, Copts singing hymns. The "doves" were consistently mentioned by eyewitnesses. Other phenomena were a "shower of diamonds," a glowing red cloud, and billowing clouds of incense. Spectacular and medically authenticated cures took place, although as at the other shrines, these were few in number compared with the multitudes of sick people. 8) With the apparitions which began in 1981 in Medjugorje in Yugoslavia, it was back to the familiar atmosphere of youngsters, trances and secrets. Four teenagers, three girls and a boy, aged fifteen and sixteen years old, saw a light on a hillside one evening in June. In the light was a young woman holding a child. She called to them, but they ran away. The following evening they returned with two more friends, a girl of sixteen and a ten year old boy, and all saw, on the opposite hill this time, the same great light encircling the woman as if she were "clothed with the sun," but they were too frightened to approach her. On the third evening the six young people were joined by a crowd of five thousand. After three flashes of light the Lady appeared, but only the six could see her—dark haired, blue-eyed, in a grey dress, with a crown of stars, standing on a white cloud just above the ground, so close they could have touched her. One of the girls, clutching a jar of holy water, said to the apparition, "if you are satan, go away," (!) and received the reply, "I am the Virgin Mary," come to "convert and reconcile." Later they saw her in a cross of rainbow-coloured light, sad, and repeating, "Peace, peace. Be reconciled." The vision appeared weekly at about 6 p.m., during the recitation of the rosary, over the past few years. She was dressed in grey with a white veil, but wore a gold-sequinned dress at Easter and at Christmas, when she held the Child. Sometimes the "Gospa" [Lady] came to the young people at home, especially if they were ill, praying with them for five minutes to half an hour. They were shown visions of heaven, hell and purgatory. (In heaven angels flew and people in grey, pink and yellow robes walked about, singing and praying. Purgatory, a place of mist, resounded to the noise of hammering on prison bars. In the fires of hell, men and women emerged unrecognizable as human beings.) The Gospa gave them messages calling for peace, conversion, prayer—the daily recitation of the Creed, followed by seven Paters, Aves and Glorias (a local devotion)—penance, fasting on Wednesdays and Fridays, and respect for other religions. The Gospa told the seers that she suffered because of the sinfulness of humanity, and that she and satan were engaged in a great battle for souls. Medjugorje would be the last place where she would appear—all future visions would be false. There would be a great sign on the hillside to convert unbelievers. Ten secrets were given to the young people, believed to be apocalyptic and warning of possible disasters to come. As the Vatican refuses to reveal Fatima's third secret, so the Franciscans are believed to be playing down the more sensational aspects of the Gospa's revelations. The former Roman Catholic Bishop of Mostar refused to accept the Apparitions as genuine but the Franciscan parish priest, Fr Jozo, supported later by the Archbishop of Split, enthusiastically supported the visionaries. Fr Jozo was imprisoned by the Communist authorities for his activities in connection with the apparitions. On his release, he was sent to the parish of Tihaljia, where, in the gleaming new church, services of healing took place for the many pilgrims who came to see and speak with the man who was the confidant of the visionaries. The laying on of hands was accompanied by embracing, weeping and fainting. Between 1981 and 1990, before the Bosnian conflict, ten million pilgrims from all over the world including many Americans and Australians, also Lutherans, Anglicans and Orthodox, had come to Medjugorje. The usual crop of hysterical stories had circulated—Christ had been seen in the sky, one woman's rosary had turned into gold—24 carat in another case—, and someone had taken a snap [shot] of the Virgin. In 1993, four of the young people were still seeing visions. Cures have been claimed, and various phenomena reported. The sun has rotated, mysterious "fires" and "rainbows" without rain have been seen, a thirty foot high stone cross on the mountainside has spun round and round, and the word "MIR" (Peace) appeared over the mountain in letters of white light, and could be seen by everyone in Medjugorje. 9) The Ukraine has been visionary territory for centuries, and in 1987 the Virgin was said to have appeared at fifteen places. On April 26th, 1987, a thirteen year old peasant girl from Hriushiw saw a light above a derelict chapel. A woman dressed in black, with a child in her arms, appeared in the light, saying that the Ukrainians had been chosen to lead the Russians back to God. The girl called her sister and mother, who immediately declared that it must be the Bogoroditsa [Theotokos]—the Virgin. From then on, streams of people flowing into the village increased, until half a million claimed to have seen the Bogoroditsa, whose outline even appeared on television on May 13th, the anniversary of the Fatima appearance. Communist authorities failed to stop the crowds and "Pravda" pronounced it the work of extremists trying to wreck Perestroika. It is not clear whether everyone heard the messages or whether they were relayed through the peasant girl, Marina, who was examined by a psychiatrist and declared to be normal. Certainly not everyone in the crowds saw the Virgin—many, including monks and nuns, saw nothing. The purport of the messages appeared to be that the Virgin sorrows for the state of the world, that the Last Times are approaching, and Chernobyl had been a warning for the world. The rosary is a great weapon against satan; the Ukraine, "my daughter," is under the special protection of the Virgin, and would become an independent state. Because they had suffered the most under Communism, the Ukrainians had been chosen as Apostles to convert Russia, and if Russia was not converted there would be a third world war. If they stayed loyal to the Pope, the third secret of Fatima would be revealed. As at Zeitoun, the appearances were irregular, they were seen by many, and the light surrounding the apparition was "lunar," not "solar," and the words used to describe the light were very similar—"moonlight but not moonlight," "phosphorescent," "silver glow," "streams of light." But there was no ecumenical spirit at Hriushiw. The messages were not conducive to any lessening of tensions between the Uniats and the Orthodox. Is God really speaking through all, or any, of these apparitions? Are any of the related solar phenomena genuine signs from Heaven, or are they counterfeit? Equally doubtful would be any suggestion of replacing "Christ our God, long-suffering, all-merciful, all-compassionate, Who loves the righteous and has mercy on sinners," with a distant, impersonal figure of wrath, bent on punishment and vengeance. The apparition of La Salette said, "I can no longer hold back the heavy arm of my Son;" the apparition of Fatima: "... already He is deeply offended." At San Damiano, 1961, 'The Eternal Father is tired, very tired.... He has freed the Demon, who is working havoc. " At Oliveto Citra, Italy, in 1985, again we hear, "I can no longer hold back the righteous arm of my Son." The sayings echo the unbalanced but very popular teachings of some of the Latin saints and preachers of the past, whereby Christ's Kingdom of justice was opposed to Mary's Kingdom of Mercy. "If God is angry with a sinner, Mary takes him under her protection, she withholds the avenging arm of her Son and saves him" (Alphonsus Liguari). "She is the sure refuge of sinners and criminals from the rigour of the wrath and vengeance of Jesus Christ;" she "binds the power of Jesus Christ to prevent the evil He would do to the guilty" (Jean-Jacques Olier). According to the visionaries, the Virgin (of Medjugorje) has said that the world is passing through a period of unparalleled darkness.... Satan ... is waging a great battle for souls with the Mother of God, who has been sent from the Eternal Father to warn and hearten them, for, as God told the serpent in Genesis, the woman "shall crush thy head." If so, this perpetuates the Roman Catholic mistranslation in the Douay Bible of Genesis, chapter 3, verse 15. It is not the woman, but the seed of the woman—Christ—Who will crush the serpent's head, by His Passion and Resurrection. The more cautious and sober Latin theologians have often been uneasy with the excesses of their contemporaries, but on many occasions the weight of popular enthusiasm has proved too strong for sound theology to prevail. Louie-Marie Grignion de Montfort (d. 1716)—a master of Marian excess—closely connected the Virgin to eschatology. With the Second Coming she must be revealed by the Holy Spirit so that Christ may be made known, and she must shine forth in power against the enemies of God, since in some way the devil fears her more than God Himself. The idea of the Virgin as always being the one who prepares the way for the coming of Christ—not only His first physical coming at the Incarnation, but of His coming into the souls of men, and of His Second Coming, has continued into modern times. "As there would have been no advent of Christ in the flesh in His first coming without Mary, so there can be no coming of Christ in spirit ... without Mary again preparing the way." "As she prepared His body, so now she prepares souls for His coming" (Archbishop Fulton Sheen). At Zeitoun, "one can perceive the salvific role of the Blessed Virgin in evidence, as it was at Fatima in 1917. This role is essentially that of preparing the way for her Divine Son, by opening the souls of mankind to His redeeming grace." "…[H]aving prepared His way 2,000 years ago among His own people" she "now prepares His way into the souls of millions of Gentiles of all faiths and none with a new and greater Visitation" (Francis Johnston: When Millions Saw Mary). One wonders if there is anything left for the Holy Spirit to do. This thinking accords well both with the current belief, prevalent in some Roman Catholic circles, in a Marian Age which is to precede the Second Coming, and with the strongly apocalyptic tone of the majority of the apparitions. But as such a role for the Mother of God is to be found neither in Scripture nor in Tradition, it inspires little confidence in the authenticity of the apparitions. Psychological FactorsIn the majority of the apparitions considered, children or adolescents were the sole or main visionaries, making it likely that an element of child psychology might well be involved. For a thorough evaluation of the visions and messages, it would be necessary to know a great deal more about the children—what kind of religious art they had been exposed to, what sermons they had listened to, what teaching they had received at school and catechism classes, and what religious books they had read. In the case of Bernadette, for instance, her visions did not come out of the blue, as is often thought. She was already familiar with the Miraculous Medal (as a nun, she was said to have worn it constantly), and the Immaculate Conception had been declared an official dogma in 1854, so for four years she must have heard it repeatedly mentioned both at church and at catechism classes, even if she did not fully understand its meaning. In addition, visions were a familiar occurrence in the Lourdes area. The essential elements of the Lourdes vision—a Lady, a shepherdess (Bernadette had at one time been engaged temporarily to mind sheep in the nearby village of Bartnes), a chapel, processions, and a spring with miraculous powers—had all featured in shrines across the Pyrenees, which in Medieval times had been on the route to Compostella. In 1475, a young shepherd at Betharvam had seen a vision of a Lady who asked for a chapel to be erected. In 1520, a young shepherdess at Gavaison had seen a vision of a Lady and the request for a chapel was repeated. Besides Gavaison, other nearby shrines of the Virgin were Poeylanum, Heas and Pietat. There was also Our Lady of Sarrance, of Bourisp, of Medous, of Nestes, of Buglose. There were also four other pilgrimage centres in the region, making fourteen established centres close to Lourdes. Whether genuine or not, Bernadette's vision fitted easily into the local pattern. The area had earlier been infected with the Albigensian heresy. In a crusade against this particular heresy by Pope Innocent III, the heretics had been put to the sword, and the Inquisition moved in. The usual methods of the Inquisition had been employed leaving behind a people orthodox in (Latin) doctrine, but no lovers of the clergy. Consequently visions were very popular, as they dispensed with the need for clerical mediation. It is well known that children of a certain stage of mental development, which can vary considerably with different children, love to have a secret world inaccessible to adults, and often play out in their minds situations where they can be important. There are a number of similarities between La Salette and Fatima, and Lucia admitted that her mother had read her the story of La Salette. And how far were Bernadette's visions an unconscious form of compensation? The Lady was small, no taller than Bernadette herself, and addressed the sickly, under-sized girl, generally referred to as "the little idiot," very politely as vous. The attention given to the youthful "seers" on account of their visions would be further enhanced by the "secrets" delivered to them—a standard feature of apparitions to adolescents and children from La Salette onwards—increasing their importance in adult eyes. Also well known is the fact that a small number of people—nearly always children and adolescents—demonstrate considerable eidetic ability, that is, vivid visual images of specific objects that are not present in actuality, but are present to their conscious or sub-conscious imagination, are "seen" by the persons concerned. Hilda Graef mentions in her book Mary—A History of Doctrine and Devotion, a very interesting experiment carried out by a psychologist, C. M. Staehlin, in which he tested the suggestibility of six boys aged fifteen to eighteen, letting there appear to them by suggestion a battle of medieval warriors above a tree. Two boys saw nothing at all, two "saw" the battle but heard nothing, and two both saw and heard the noise, even the shouts of individual knights. None of the boys had been able to communicate with each other, yet even the two who saw and heard agreed in every detail. In the apparitions we have the same thing—the agreement of children, their apparent telepathic communication with each other, the fact that some only saw, while others both saw and heard the apparition speak. How much were suggestibility and eidetic gifts in evidence when twelve year old Eugene Barbadette saw a Lady in a blue robe with gold stars in the sky at Pontmain, France, in 1871? The ceiling of his parish church was painted blue with gold stars. Adult neighbours who gathered saw nothing, although other children claimed to see the apparition. Once the local priest arrived on the scene, the vision became more elaborate, with a blue oval frame with writing inside it (echoes of the Miraculous Medal), small white crosses, a large red cross, and four candies that lit themselves. The parish priest had previously had white crosses erected all over the parish, he was leading the small crowd in the recitation of the "red rosary" in honour of twenty-six Japanese martyrs (which may have suggested the red cross), and he himself always lit four candies after Sunday vespers in front of a statue of the Virgin of the Immaculate Conception. However, eidetic ability and ordinary developmental factors are not sufficient by themselves to account for the children sticking to their stories when in some cases they were repeatedly questioned, mocked, physically punished for "lying," and even imprisoned. Nor would they account for the trances, sometimes lasting for hours, during which the young people—at Garabandal, for instance—were impervious to flashing lights, cigarette burns, and having pins stuck in them. A neurologist from Barcelona medical school, who examined the Garabandal visionaries during and after at least twenty trances, could find no explanation, declaring them to be perfectly normal young people. Trance is acknowledged by psychologists to be connected with religious ecstasy and visionary experiences, but also to be linked with mediumistic ability, whereby paranormal physical effects and materializations can be produced. Trance states are, of course, well-known to pagan shamans and medicine men. s continued to see it and marvel. Gnosticism is clearly linked with the present clamour for the ordination of women and the use of inclusive language for God, but the ancient pagan goddess seems more closely linked to the Marian apparitions. Gnostic heretics allowed women to minister equally with men as priests and bishops, and adopted some Christian beliefs, distorting them unmercifully to fit them into the Gnostic religious / philosophical system, but their interest lay not with Mary, the human Mother of God, but with God "the Mother," that is, the Holy Spirit. Some Gnostics developed an immortal Sophia figure, and at times saw the Virgin Mary as one of her incarnations, but there seems nothing that would lead to a Christian cult of Mary such as prevailed in the Roman Church. The one Great All-Mother of the pagans showed herself in various forms of nature on earth and in the sky. Having no human shape, she was worshipped at sacred sites and high places marked with pillars. Later she was represented in human form, attended by doves and snakes, symbolizing her power in the air and on earth. Pre-eminently she was the Bringer and Sustainer of life, the bearer of fertility to man and nature, and, in her later role as Muse, the inspiration that gave birth to music, art and poetry. As societies merged and influenced each other, the Goddess became fragmented and identified with local deities, taking on their characteristics. As Neith, brought from Libya to Egypt, she was a cosmic virgin-mother, who "gave birth to the Sun, and became a mother when none else had yet borne children." As Isis, she tells a supplicant that in many different places, she, the one, is "worshipped in many aspects, known by many names"—Mother of gods, Artemis, Aphrodite, Mother of the Corn, Persephone the Maiden par excellence. Likewise the Lady of the apparitions is venerated in many localities under a variety of names and aspects—Our Lady of the Rosary, Virgin of the Poor, Mother of Consolation, The Immaculate Conception, and so on. Mary, then, has appeared to me in a new light since I have visited Lourdes. I shall in [the] future not only hate to offend her, but fear also. It is a fearful thing to fall into the hands of that Mother who allows the broken sufferer to crawl across France to her feet and then to crawl back again. She is one of the Maries of Chartes that reveals herself here, dark, mighty, dominant and all but inexorable: not the Mary of an ecclesiastical shop who dwells amid tinsel and tuberoses. Doubtless men thought like this of the Magna Mater long ago, or of Artemis, benign enough at Athens, but dark and terrible as Diana of Ephesus. Geoffrey Ashe (Miracles, 1978) commenting on the "miracle of the sun" supposedly performed by the Lady of Fatima wrote, "Even to accept it as Mary's doing is surely to admit that she has an alarming and inscrutable aspect, which does not sit well with Christian ideas of her." If the Goddess does play a part in the Marian visions, France would seem to provide a naturally fertile ground for them, since there, on the whole, the Goddess seems to have been benign and helpful. There had been a temple of Isis at Soissons, a strong mother cult in the region of Treves, the cult of the Earth Mother prevailed in the Seine, Oise and Tarn regions, and there were many shrines to minor goddesses, who protected springs. There were also enchanting nymphs who protected springs, rocks and water, and a multitude of "white ladies," descendents of the Earth Mother. In Rome, Cybele, the Great Mother of the gods, a divinity imported from Asia Minor was credited with the defeat of Hannibal and developed a lasting following. A special feature of the statues of Cybele was that they were crowned and carried from place to place. Similarly, a further development of the apparitions has been the solemn crowning of Marian statues and their procession, especially at Fatima, from place to place. In 1864, the Garaison Virgin had been crowned with Papal permission (Pius IX), followed by La Salette (Leo XIII) and Fatima (Pius XII). In 1954, Our Lady of Knock, Queen of Ireland, was crowned. Earlier, in 1732, by permission of Clement XII, the Virgin of Svata Hora in Slovakia was crowned with the diadem of the Holy Roman Emperor. That the Mother of God, representing redeemed humanity, is glorified and reigns with Christ is beyond doubt, but this earthly crowning tends to set her apart from us and to obscure the fact that her heavenly crown is not the "diadem," the royal emblem of monarchy, but the stephanos, the crown of laurels given to those who are victorious in the battle of life, the reward for faithfully striving, attained through suffering and purification, the crown with which all Christians hope and pray to be crowned. Universally worshipped, the Goddess supplied a deep need in the human psyche for the Eternal Feminine. Sometimes she acted in her own right as sole superior deity, sometimes as co-equal partner to a male divinity, and sometimes in a Goddess-Spouse / Son relationship. Only among the Hebrews, led by their fiercely monotheistic and uncompromising prophets, was there no place for the Goddess, and even the Hebrews, surrounded as they were by polytheistic societies, sometimes relapsed into pagan worship. With the Hebrews, the serpents of the Goddess, benign symbols of healing and wisdom, were reduced to an evil tempter, and Eve, the mother of all the living, became a Pandora figure unleashing sin and death on mankind. The dove, the other attendant of the Goddess, was not demoted, most likely because of its connection with Noah and the Ark. The Lady of Zeitoun has her attendant "doves," and the serpent appears, in the accepted Judaeo-Christian form as the symbol of evil, beneath the feet of the Lady of the Miraculous Medal, while the vision of Medjugorje is engaged in a battle to crush the serpent's head. If the assumption of a Goddess connection with the apparitions is correct, how did she gain a foothold in the Latin Church and remain undetected? The Apostolic missionaries moved out from a strictly monotheistic background to encounter societies steeped in a world of gods and semi-divine human beings. Doubtless for many converts to Christianity, the old ways of thinking could not have been easily shed, even after Baptism. From the Church Father, Epiphanius, we learn of a sect, composed mainly of women, nicknamed the Collyridians. Originating in Thrace, it had extended to Upper Scythia (roughly to the west and north of the Black Sea) and into Arabia by the fourth century. It seems to have been inspired by the Gospel events, combined with an Elias-type legend of Mary's purity and "non-death." St Epiphanius states that the "priestesses of Mary" worshipped her as a goddess in her own right, the Queen of Heaven, with rituals far older than Christianity, and "adorn a chair or square throne, spread a cloth over it, and at a certain solemn time, place bread on it and offer it in the name of Mary." Recalling the Jews, condemned by the Prophet Jeremias, who made similar offerings to the "Queen of Heaven"—in their case, Astarte—he warns against the worship of the Virgin as strongly as he had also warned against a lack of proper respect for her. This is the seventy-ninth heresy in a long list, challenged by Epiphanius, yet somehow it seems more like a different religion than a Christian deviation the ancient pagan religion of the Goddess, under her new manifestation: "Mary." While it is unlikely that the Collyridians as such influenced the Church, this shows how such distortions of true belief can arise and it might be that a more orthodox version of some of their ideas might well have been congenial to some new converts from a pagan background, lying dormant until the right combination of circumstances caused them to take root. While working on this study of the apparitions, I began to feel what seemed to be the presence of another religion, running side by side with Christianity; so I was interested to discover that the nineteenth century French novelist Emile Zola had experienced a similar feeling, and believed he perceived "almost a new religion" at Lourdes. Within the Church, Christ [is] the Second Adam, but once the Virgin had been seen in a certain sense as the Second Eve (without, of course, the slightest surrender to paganism) this was likely to have recalled to the spiritually weak the Goddess-Son / Spouse relationship; while the title Theotokos, although solely concerned with teaching that Christ was God, might surely have evoked the memory of Cybele, Great Mother of the gods, except that this was in fact an even greater title, the Mother of God. As paganism crumbled and local deities were dethroned, it was more often than not the Mother of God who was put in their place as patroness of healing springs and holy mountains, for long centuries associated with pilgrimage. In the West, where the theological and liturgical foundation was perhaps weaker, during the Middle Ages "Our Lady" of one district came to take on an almost separate personality from the Virgin of a rival shrine. Sir Thomas More, the Roman Catholic Tudor martyr, commented, "They will make comparisons between our ladie of Ippiswitch and our ladie of Walsingham, as weening that one image hath more power than the other." Nothing like this happened in the East. Rooted soundly and soberly in the solid theology of Orthodoxy, and spiritually nourished by a vernacular liturgy, the Lord's Mother fitted naturally into her rightful place in a perfectly balanced and harmonious whole. The Western distortion of the doctrine of the Holy Trinity resulting from the Filioque with its (almost unintentional) down-grading of the Holy Spirit, together with the historical events that overtook the Western Empire in the shape of the invasion of barbarian tribes and the resultant consequences, increasingly isolated the Church in the West from the pure Orthodoxy of the Church in the East. With the restoration of order and stable government at the end of the Dark Ages, the Church in the West found itself with a largely illiterate and semi-barbarian laity. Churchmen had to supply the clerks and lawyers needed by the lay rulers. In consequence, the Papacy found itself relying on ecclesiastical lawyers, and this was to give the Roman Church the legalistic outlook and systematic philosophy which are its hallmarks. The ecclesiastical establishment acquired an overriding authority, and with the enforced celibacy of priests, "the Church" in common parlance came to mean the clergy. A faulty Trinitarian theology, and an undue emphasis on the Augustinian teachings on original sin and the Atonement, together with an all-male hierarchy, led to the loss of the feminine element in Western Christianity and created a "Goddess-shaped gap." The Virgin Mary was the obvious candidate to fill that gap. In contrast, the Tradition was handed on unchanged from generation to generation in the Eastern Church. Apart from the treacherous Fourth Crusade, the Roman Empire in the East remained unconquered until the arrival of the Turks. There was always an independent and highly-educated laity. With a powerful Emperor there was never any opportunity—nor was there any need or the desire—to subject all lay power to the authority of the Patriarch, and "the Church" continued to mean the whole body of the faithful, past and present, including the angels. Married priests ensured that the priesthood was not a class apart. (As today, the priest lives in the same kind of house as his parishioners—a village priest in Cyprus may also be the village bootmaker, and a Greek papas, in cassock and stove pipe hat may be seen clasping a small son or daughter with one hand and a shopping basket with the other). There was no Goddess-shaped gap to be filled in Orthodoxy, and anchored safely in Orthodox theology and hymnology, the holy Virgin, more honourable than the cherubim and beyond compare more glorious than the seraphim on account of her Divine Maternity, remained a woman with a human nature in all points like our own, completely purified by the Holy Spirit at the Annunciation in order that she might be able to give a human nature to the Eternal Logos. In the Latin Church, Marian exaggeration soared to ever new heights, checked only briefly by the Protestant Reformation. The Virgin had "added certain perfection to the Maker of the universe" by giving Him a human nature—quite the opposite view from that taken by Scripture and Orthodoxy, which saw the Incarnation as a kenosis, a self-emptying, of Christ—"though He was rich, yet for our sakes He became poor." Bernadine of Siena's weirdest fantasy, the "seduction of God," was described in language more appropriate to a Greek legend of Zeus than to the Great Mystery of the Incarnation. The Virgin was higher than the Church ... she had authority over her Son in heaven ... she appeased the Divine justice and prevented God from chastening sinners ... she and the Holy Spirit produced Christ in souls. "Even the tongue of the Holy Spirit" was "scarcely sufficient to celebrate her praises worthily"! Unfortunately the authors and preachers of such offensive nonsense were frequently canonized, which was naturally taken as a sign of official approval. Such distortions could well be the stuff of which Marian apparitions are made. The Goddess, or at least a semi-divine being, had returned. It is interesting to note that John Henry (Cardinal) Newman was appalled at all the excesses. While accepting the Immaculate Conception, he considered the popular exaggerations and other deviations from Patristic teaching to be "calculated to ... unsettle consciences, to provoke blasphemy, and to work the loss of souls." In a quaintly nationalistic touch, he noted that all these devotions and teachings were clearly the work of foreigners and not Englishmen! Goddess will be so easily dislodged. How did these apparitions acquire national and even international fame? How is it, for instance, that a young girl's real or imaginary visions turned Lourdes not only into a major religious centre of the Roman Catholic Church, but into a major tourist industry, a "religious Disneyland," with more pilgrims than the Holy Land, more hotels than any city or town in France other than Paris and Nice, a factory that produces over a ton of candles daily, and souvenir shops where one may purchase Virgins in snow-storms, Virgins in TV sets, and Madonna shaped holy water bottles, a metre high, with removable golden crowns for filling? Of course, all the regrettable and tasteless commercialism has no bearing on the authenticity or otherwise of the visions. Politics and ecclesiastical manipulation (as well as the coming of the railway) played their part. In France, reaction had set in against the anti-church French Revolution and the spirit of rationalism. The Marian visions were in line with popular demand, and encouraged by the ecclesiastical authorities, were important in reviving a declining Catholicism. In fact, Lourdes gave such an impetus to Marianism in the nineteenth century that a rival movement was started to encourage pilgrimage to shrines directly connected with Christ. Here again we see the separation of the Mother and the Son. The fact that her own devotion was Christ-centred, rather than Marian-centred, may have been one reason why Bernadette's novice mistress, Mother Vauzou, was never convinced that Bernadette's visions were genuine. Fr Peyramale, the parish priest of Lourdes, who had supported Bernadette and built a chapel at the grotto, was quickly bypassed by the Garaison Fathers, professional revivalists, who had been sent by the Bishop of Tarbes to take over Lourdes as part of the revivalist campaign. The Bishop had from the first recognized the apparitions and authorized the cult. The Garaison fathers were installed to run the mission to the pilgrims as distinct from the parish church, and apparently exchanges between them and Fr Peyramale were extremely acrimonious and vindictive. The feud between the parish and grotto continued after Fr Peyramale's death, involving lawsuits of "horrible complexity." Zola's "savage satire of dog-collar-eat-dog-collar was based on solid fact" (Alan Neame: The Happening at Lourdes). The Third Republic regarded religious demonstrations as pro-royalist, and anti-Catholic riots broke out with attacks on pilgrims. The response of the ecclesiastical authorities was to stage a national Catholic rally at Lourdes in 1872, attended by nine bishops and twenty thousand people, further encouraging Lourdes as a religious centre. All modern Popes have been Marianists, and John Paul II has given an extra boost to Lourdes by his personal support, and his visit to the Shrine, the first by a Pope. At the time of the Fatima visions, Portugal was going through a period of severe anti-clericalism. A left-wing republic had replaced the old monarchy, and there were strikes, crime, corruption, bomb-throwing, inflation and food shortages together with the added complication of the First World War. The Roman Catholic Church was regarded as a major supporter of the deposed monarchy, and clergy were restricted in their preaching and forbidden to wear clerical dress. After 1926, the Church recovered its former position. The Vatican, encouraged by the success of Lourdes, was instrumental in launching Fatima as a shrine of rival status and authenticity. Papal involvement with Fatima has been very marked. Pius XII, very pro-Fatima and violently anti-Communist, consecrated the world to the Immaculate Heart of Mary in 1942, and in 1954 made a special consecration of Russia as directed by Lucia, the surviving visionary. Paul VI, who was to give the Virgin yet another title, "Mother of the Church," visited Fatima in 1976. Pope John Paul II, whose motto is "I am completely yours, Mary," and who apparently has the letter M embroidered on his robes, is also a keen Fatima supporter, and after the unsuccessful attempt on his life (he attributed his deliverance to Our Lady of Lourdes), had the bullet set into the crown of the Fatima Madonna. The supposed directives concerning Russia are behind the present unprecedented Vatican campaign of proselytism in Russia. There was also a political dimension at Turzovka in Slovakia, Medjugorje, and Hriushiw, in the clash with Communism, and in the latter two a very strong nationalist and Vatican element. Medjugorje is a Croat enclave in predominantly Orthodox and Moslem Herzegovina. Croat nationalism has always gone hand in hand with Roman Catholicism ("to be a Croat is to be a Catholic,"). In World War II, Pius XII, in his paranoid fear of Communism, did nothing to stop the massacre of 750,000 Orthodox Serbs by the fascist Croat Ustashi of the puppet "Independent State of Croatia" set up by the Nazis. Cardinal Stepinac of Zagreb saw the Orthodox Church as an evil "almost greater than Protestantism," and Franciscan friars ran the most notorious of the concentration camps. In the Medjugorje vicinity, fifty men, women and children were thrown from a cliff-top, and all the monks at a nearby Orthodox Monastery were buried alive. It is interesting to note that while the former Roman Catholic bishop of Mostar, Mgr Pavao Zanic, denounced the visions as "all the fruit of fraud, disobedience to the Church and disease," they were enthusiastically taken up by the Franciscan parish priest of Medjugorje, who heard a "voice" telling him to protect the visionaries. If and when the troubles in the former Yugoslavia get sorted out, Medjugorje is set to take up where it left off as part of the (Roman Catholic) tourist industry and an international pilgrimage centre. For centuries there has been tension in what is now the Ukraine between the Orthodox Church and the Vatican on account of the activities of the Uniats, who are once again conducting a militant, aggressive campaign engineered by nationalist and religious extremists. Hriushiw fits easily into this pattern, with its echo of Fatima in the call for the conversion of Russia and the messages from the apparition that the Ukrainians have been specially chosen for this work. In passing, mention might also be made of the nationalist / religious mix in the Virgins of Guadalupe, Mexico, and Czestohowa, Poland. In 1531, a "dark" or Indian Virgin appeared to an Aztec peasant and told him to request the bishop to build a shrine on the spot of the apparition's appearance, which just happened to be an important sacred place in the native Indian religion. Her image was miraculously imprinted on the peasant's cloak. Indian self-respect in the face of the white man was restored while the ecclesiastical authority rejoiced at gaining a vital aid in converting eight million Indians to Roman Catholicism in the space of four years. In 1910, Pope Plus X proclaimed the Virgin of Guadalupe the "Empress of the Americas." The Virgin of Czestohowa, in the Jasna Gora monastery, is synonymous with Polish Roman Catholicism and nationalism. The chapel housing the icon is in the centre of "a huge complex, a highly organized pilgrim centre," run by the Pauline fathers. The Virgin is unveiled four times daily, when to a fanfare of trumpets, a silver curtain slowly rises. It would seem that all the great Marian shrines bear the twin stamps of Roman efficiency and professional stage management. In 1717, the "Queen of Poland and Grand Duchess of Lithuania" was solemnly crowned by formal decree of the Polish Parliament. Such secular titles sound somehow strangely incongruous when bestowed on her to whose sublime title, Mother of God, no further glory can be added. The words of a Roman Catholic writer, spoken of Lourdes, seem equally applicable to other Marian shrines—"a bastion of the temporal power of an infallible Papacy." The heavens declare the glory of God, and the firmament proclaimeth the work of His hands (Ps. 18:1—Septuagint numbering). Allowing for auto-suggestion, over-active imagination, pretending to see things so as to be like other people, there remain enough solid witnesses to make it clear that there have been many instances of spectacular solar phenomena at the shrines. Are they natural phenomena, signs from heaven that accompany the presence of the Mother of God, or part of the "signs and lying wonders" campaign in preparation for the Anti-Christ? In the Old Testament, the sun stands still for Joshua (Jesus, son of Navi), and moves backwards for Hezekias, while in the Gospels we have the Star of Bethlehem and the darkening of the sun at the Crucifixion. In the Church, we know the Cross of Constantine the Great, the Cross seen over Jerusalem in 357, and the Cross over Athens in 1925. Throughout history, strange things in the sky have been seen and recorded. At the beginning of the tenth century, Bishop Radbod of Utrecht recorded a sky filled with stars which seemed to "crash one upon another," a sign which was followed by many natural and historical disasters. Halley's Comet, visible in England in 1066, is embroidered on the Bayeux Tapestry. During the Wars of the Roses, a contemporary chronicler recorded "three suns in one" appearing before a battle, which the leader of the Yorkists, the future Edward IV, declared was a good omen as it signified the Trinity, thus calming his frightened troops. Shakespeare used this account when he mentioned this sign in his play, "Henry VI." In 1646, a book was published called, Strange Signes from Heaven, recording sightings of many phenomena, and in 1882 Walter Maunder, a Greenwich astronomer, published an account of the most remarkable thing he had ever seen in the course of many years sky gazing. Together with hundreds of people all over Britain, he witnessed a great circular disc of greenish light which lengthened out into a cigar shape, more than a hundred miles above the earth, at least fifty miles long, and moving very rapidly at about ten miles a second. Scientists today can explain it as part of an auroral display. There had been a violent magnetic storm at the time, and charged particles from the sun plunged into the earth's atmosphere and lit up like a neon light. A beam of particles would create the appearance of a solid object moving at speed. When the beam had spent its force, it would simply break up like a cloud, which it did, over Europe. No doubt many "strange signs from heaven" are in fact natural phenomena. A well-known natural phenomenon is the "halo," when the sun's image, refracted through ice crystals, forms a cross with the sun at its centre. There are "mock" suns and moons known to astronomers, and the planet Venus, when viewed through the polluted air near the surface of the earth, appears to change colour and make erratic movements. A programme appeared on television, Christmas 1993, about the Star of Bethlehem. One scientist / astronomer said that natural phenomena occur every year, and if the Church could give him a definite date for the Nativity, he would be able to say what it was the Wise Men saw, as all the dates for the movements of the planets are known. Some of the solar phenomena seen at the very many shrines all over the world are undoubtedly purely natural in origin. But hundreds of people who claim to have seen the sun "dance" have been able to look at the sun with ease for long periods with no damage to their optic nerves. But not everyone present saw exactly the same thing, and some saw nothing at all, so obviously the dancing sun does not have a natural cause, and perhaps has to do with a mass hallucination of some kind. Certainly the sun could not physically have spun and zigzagged, or that would have been the end of the solar system. All the well-documented accounts of the "miracle of the sun" at Fatima stress the terror of the crowd, many of whom—but not all—saw the sun spinning in a mad whirl, then detaching itself from the sky, spin towards the earth in a huge fiery mass, and return to its place. The movements were repeated twice. While some people at the shrine saw nothing, others fifty kilometres away saw the spectacle and believed that the end of the world had come. The sun changed colour, giving off red, then yellow, then purple light, In The Dancing Sun, Desmond Seward quotes a passage from an unpublished account of events at Turzovka. In 1958, the Mother of God is said to have appeared to a forty-two year old forester, a "vague believer," who saw a beautiful woman in white holding a rosary and floating in the air. Altogether there were seven appearances, in the same place and at the same time weekly. The forester was told to pray for reconciliation and atonement by the world for its sins; there were the usual apocalyptic warnings and the stressing of the rosary. Crowds from all over the Slovakian countryside came to the mountain, a spring burst forth on the spot of the apparition and healings took place. The Communist authorities put the forester in an asylum, but later released him. Strange lights were reported, and in 1963 the miracle of the sun took place. "The fiery orb ... seemed to be ablaze, burning, with flames bursting out of it.... among over 500 people who were watching in consternation there was only shocked astonishment. After a few moments an enormous cone-shaped light spread above and around us, like an over-sized tent made of long, vividly hued strips. It consisted of every colour in the spectrum, from red to violet ... All around, coloured strips covered the sky, the trees and their branches, the ground and the people. The strips fanned out from a single focal point in which was the sun. I saw deep blue and bright yellow people next to me, whose colour changed when they moved." Three local brass bands with the pilgrims formed up and played fortissimo the hymn, "We salute you a thousand times, Mary," as everyone believed this to be a sign of the presence of the Mother of God. Reading about it at second hand, one rather gets the impression of a sort of supernatural religious disco, but to the writer it was "strange and deeply moving, overwhelming ... God-related." It had never occurred to me that there could be some connection between UFOs and the shrines, until quite by chance a book about UFOs in a pile of second hand books in a local antique shop caught my eye. Glancing through it, I was astonished to find, among many sightings reported in England in 1967, two that immediately sounded familiar. The first concerned two women neighbours living on an estate in Stoke-on-Trent, who, together with some children playing in the street, saw a "flying saucer" land in a field not far from the estate about 9 p.m. on September 2nd, 1967. The field "looked as though it was on fire—like a bonfire," "it was just as if someone had got a great big bonfire." Within minutes the police, summoned by the women arrived, but all was in darkness, and a daylight search revealed nothing. At Medjugorje in August 1981, along with a spinning sun sending out multi-coloured rays, rainbows without any rain, and other phenomena, a fire appeared to break out on the Hill of the Apparitions, but when the firebrigade arrived there was no sign of it. The second concerned the Flying Cross. Between 1959 and 1967, 808 investigations into UFO sightings were carried out by the Ministry of Defence, with help from the Royal Observatory, the Meteorological Office, the Royal Air Force, the United States Air Force stationed in Britain, radar establishments, Air Traffic Control and the police, although there seems to have been no inquiry at the highest scientific level. The vast majority of the sightings proved to be purely natural in origin—satellites and debris, meteorological balloons, celestial objects (Venus, etc), aircraft, natural phenomena such as mock suns and moons, cloud reflections and the inevitable few hoaxes. Of the 84 unexplained sightings, some involved those where information was insufficient to make a decision, but the Flying Cross was one of the remainder, well-documented, but for which no explanation could be found. During October 1967 lights that flew slowly, hovered, formed a cross, and moved off at tremendous speed were seen by over a dozen reliable witnesses, including policemen and BBC engineers. The light was "not piercing but it was very bright. It was star-spangled—just like looking through wet glass. "The Thing" was always seen at night or in the early hours. A retired RAF Wing Commander was driving with his wife in Hampshire one October night when they saw seven flying lights that made no noise, seven bright lights in formation in the sky. At first the lights formed a perfect V but later rearranged themselves into a cross. "They certainly seemed to be under some sort of control—the formation was perfect," said the Wing Commander. This sounded strangely similar, indeed at times identical, to descriptions by witnesses of the apparitions over the Coptic Church of St Mary at Zeitoun, Cairo, six months later. A Coptic Bishop, Gregorios, in charge of Higher Studies, Coptic Culture and Scientific Research, who saw the apparition on many occasions said, "Before the apparitions take place, some birds that look like pigeons—I don't know what they are—appear in different formations.... They do not flap their wings, they glide.... Whatever formation they take, they keep. Sometimes as many as seven of them fly in the formation of a cross. They fly very swiftly. They are ... completely lighted. One does not see feathers at all—just something bright. They are radiant creatures, larger in size than a dove or pigeon." A special committee of Coptic clergy appointed by the Coptic Pope said in their official report, "... Another night we saw doves with the bright colour of silver and with light radiating from them. The doves flew from the dome to the sky direct. We then glorified God Who has allowed the terrestrials to see the glory of the celestials ..." The Coptic Pope Kyrillos VI said in his statement confirming the authenticity of the apparitions, that the glittering apparition was "preceded by some spiritual forms such as doves which moved at great speed." I read and re-read the UFO accounts and the Zeitoun accounts. Was it possible that "The Thing" seen briefly in England in October 1967 had turned up again in Egypt six months later for a lengthy stay of three years to become the Coptic clergymen's "celestial beings" and the Coptic Pope's "spiritual forms"? By a strange coincidence, while I was writing this article, my husband called to me one evening early in June to come and look at a most unusual sunset effect. Lit by the most glorious rose-gold glow were clouds in an amazing deep pink and purple hill and valley formation. "It's the Judaean Desert!" exclaimed my husband. Next to it was a "map" of the Mediterranean, with the boot-shape of Italy clearly showing, together with the whole Mediterranean coastline. From behind surrounding deep rose-coloured clouds came powerful rays of golden light. Neither of us had ever seen anything like it, and we stood watching until it had faded. It was incredibly beautiful and awe-inspiring, and in a way a spiritual experience, because the overriding thought was "glory to God," and yet it was entirely natural. I thought afterwards of the English Math teacher at Garabandal in 1974, who saw the dancing sun, a disfigured Christ in the sky, "maps" of various countries together with rays of great light which she felt meant the presence of "an All-Powerful Being," which she took to be "the Eternal Father", who was sending out "rays of terrible anger" onto London on the map. I wondered what she would have made of "my" sunset if she had seen it at Garabandal or some other shrine. Discounting the natural phenomena, unless we believe that the "doves" and dancing suns are genuine signs from Heaven sent to confirm faith, to indicate the gracious presence of the Virgin, and to warn of disasters which can only be averted by repentance, then it seems we are left with the possibility of some kind of mass hallucination, or with part of a "signs and lying wonders" campaign in preparation for the Anti-Christ. According to St Luke's Gospel, in the last times there will be "terrors and great signs from heaven." St Ignaty Brianchaninov, writing over a hundred years ago, warned that a time was approaching when there would be numerous and striking false miracles. "... the miracles of Anti-Christ will be chiefly manifested in the aerial realm, where satan chiefly has his dominion. These signs will act most of all on the sense of sight, charming and deceiving it. St John the Theologian, beholding in revelation the events that are to precede the end of the world, says that Anti-Christ will perform great signs, and will even 'make fire to come down out of heaven upon the earth in the sight of men' (Revelations 13:13). This is the sign indicated by Scripture as the highest of the signs of Anti-Christ and the place of this sign is the air." Several of the apparitions have prophesied a Great Sign to come. Why is it that these apparitions are accepted so readily by the visionaries themselves and by countless pilgrims? Heterodox Christians have very little idea of one of the key concepts of Orthodox ascetical teaching prelest—spiritual deception—whereby a mirage is mistakenly accepted for truth. There are many examples in the Lives of the Saints where monastics and ascetics, many of whom went on to achieve genuine holiness, fell into delusion, entertaining demons in the form of angels, and even "Christ" Himself, receiving "revelations," seeing "light" in their cells and hearing "the Lord" speaking to them. Sometimes "Christ" granted them gifts of "prophecy' and astonishing powers. St Diadochus of Photiki warned against accepting the deceit of the evil one under the form of light or some fiery form, and St Symeon the New Theologian warned of evil spirits who cause many and various deceptions in the air. Imageless prayer, as taught by the ascetics and elders of the Orthodox Church, is in direct contrast to that of, for instance, a person seeking help from a Protestant Healing Mission, who may be told at the prayer session preceding the healing service to imagine a golden light streaming down on him from heaven, and to the meditation practices common in the West for centuries, whereby one was encouraged to imagine a chosen scene and try to visualise the Child in the manger or the Crucified Christ. St Mark the Ascetic warns that "Once our thoughts are accompanied by images, we have already given them our assent." This image-producing faculty may, in the spiritually advanced be used creatively, as in the iconography of St Andrei Rublev and devout iconographers generally, but time and again we are warned that those not yet possessing spiritual discrimination should beware of being enticed and led captive by illusory appearances. What many Marian apparition enthusiasts do not realise is that spiritual phenomena are almost commonplace these days. The Pentecostal / Charismatic groups are very quick to identify their experiences with the Holy Spirit, just as the Protestant revivalists in Indonesia in the 1970's unquestioningly accepted their "voices," "angels" (invariably quoting Scripture by chapter and verse), visions of "Christ," healings, miraculous lights accompanying evangelists, and mysterious fires from heaven that consumed Roman Catholic statues, as genuine. People who bring "Christian" ideas to their experiences often assume, all too readily, that they actually are Christian experiences, the work of the Holy Spirit, and they seldom pause to ask if they might possibly originate from quite another kind of spirit. Even when these experiences are genuinely Christian, the words of a saint of the Roman Catholic Church, John of the Cross, sound a timely warning: "All visions, revelations and impressions of heaven, however much the spiritual man may esteem them, are not equal in worth to the least act of humility; for this brings forth the fruits of charity, which never esteems or thinks well of self, but only of others." The Cure d'Ars did not accept the La Salette visions, the ecclesiastical authorities at Garabandal were unimpressed, and the former Roman Catholic bishop of Mostar denounced the Medjugorje apparitions. Certainly some of the visions would appear to be initially the result of psychological factors. Most of us do not have a strongly developed sense of self-awareness. We know very little about ourselves and have little understanding of the mysterious, but entirely natural, workings of the sub-conscious mind and the effects it can produce. Apart from self-delusion, there is a possibility of unconscious mediumistic participation or even more direct demonic delusion. If Bernadette, waving her rosary at "Aquero," and the Medjugorje youths clutching their holy water jars and admonishing "the Gospa," "If you are satan, go away," really suspected the presence of a demon, they surely seriously underestimated the power they were dealing with. "Jesus I know, and Paul I know, but who are you?" (Acts 19:15). The aged God-bearing Elder and Confessor of Mount Athos, Fr Sabbas (+ 1908), when asked to deliver a monk possessed by a demon, prayed and kept a complete fast for a week before doing so, and delivered another monk who had been deceived by a false "guardian angel," who had prayed and spoken with him daily for two years, by prostrating himself as "with pain and tears he prayed to the Lord to take pity on His servant and rebuke the evil demons." Staretz Amvrossy of Optina, who as a great monastic [and] spiritual guide, was frequently asked for advice on visions and voices, relied on the basic teaching of the Fathers, and warned those who sought his guidance on such matters not to trust in voices heard during the time of prayer or in changes in the icons—fragrance or fiery flames coming from them—which might seem to be good, but to attach no significance to them as such things also come from the deceit of the enemy. In a question and answer session with a Franciscan, one of the Medjugorje "seers" was asked why Ivanka, the girl who first saw the apparition, said at once, "It's the Blessed Virgin." The reply was, who else could she have thought of? A wonderful young mother with a child and a crown on her head. It was clear." The apparition was accepted unquestioningly as being the Virgin and was spoken with before any throwing of holy water (advised by the older women of the village) was resorted to. "My angels," as the apparition repeatedly called the young people, asked for a sign, and the vision obligingly made the hands turn on the watch of one of the visionaries. At Ivanka's last vision on May 7th, 1985, the Gospa, in answer to Ivanka's request, caused the girl's mother, who had died some months before the apparitions began, to appear. "Our Lady asked me what I would wish and I asked to see my earthly mother. Then Our Lady smiled, nodded her head, and at once my mother appeared. She was smiling. Our Lady said to me to stand up. I stood up, my mother embraced me and kissed me ... She then spoke to Ivanka and disappeared. Complete trust was given by the young people to the apparition of Medjugorje, a trust that would be encouraged by the Franciscans, who acted as their confidantes and spiritual directors. There was no concept of prelest, there seemed to be no recognition of the fearful darkness of the fallen mind. The same argument used to support the authenticity of Medjugorje—"the tree is known by its fruits"—fervent prayer, conversions, healings, sense of peace and joy—has been used by "Charismatics," Protestant Revivalists, the Evangelicals in Indonesia, and various heretical movements throughout history. Hindus and Buddhists doubtless say the same thing as they point to the intense devotion of their own followers on mass pilgrimages to the temples, and the reported healings at the shrines of their own holy men. St Ignaty Brianchaninov, in his warning to Orthodox Christians, reminds us of the frightful danger of being deceived by evil spirits. "If the saints have not always recognized demons who appeared to them in the form of saints and Christ Himself, how is it possible for us to think of ourselves that we will recognize them without mistake! ... The holy instructors of Christian struggle ... command (us) not to trust any kind of image or vision if they should suddenly appear, not to enter into conversation with them ..." but in resolute awareness of one's unworthiness and unfitness for seeing holy spirits, to entreat God that He might protect us from all the nets and deceptions, which are cunningly set out for men by the spirits of malice." ... "The only correct entrance into the world of spirits is the doctrine and practice of Christian struggle. The only correct entrance into the sensuous perception of spirits is Christian advancement and perfection." Some people assume that the apparitions must be genuine because cures take place at the shrines, but there is not necessarily any connection between the two. The number of cures is actually very small considering the multitudes of sick people who flock to the shrines. At Lourdes, in the one hundred and twenty-two years from 1858 to 1980, only sixty-four cures were finally pronounced miraculous—that is, not attributable to any known natural or medical cause—out of a possible five thousand. While the medical authorities naturally need to be cautious, it does seem somewhat artificial and presumptuous for a group of human beings to solemnly declare that God has not only performed a miracle, but has performed it properly, to their satisfaction. At several shrines the Virgin was reported as saying that she would heal some, but not others, and to read that "the finger of God would flash down unpredictably" somehow introduced a certain element of capriciousness which was disturbing, however much one might want to rejoice at the cures themselves. But the Marian shrines are not alone in claiming healings for people of all faiths and of none, although they tend to get the most publicity. The Anglican London Healing Mission lists many astonishing cures every month, the Pentecostal / Charismatic groups also claim cures, as do Spiritists (The National Federation of Spiritual Healers), and, in its heyday, the Christian Science movement had an impressive healing record. It is said that no-one is infected by bathing at Lourdes, but there is no record kept of infections, and, in any case, people in seventeenth and eighteenth century England were exposed to the same risk in the fashionable spa waters (Samuel Pepys at Bath had grave doubts about the wisdom of using the waters), yet there were no recorded outbreaks of typhoid or cholera. The authorities at Lourdes know that they cannot risk an outbreak of infection or the baths would have to close, and healthy pilgrims are encouraged to wash at the taps instead of bathing. It is interesting to note that Bernadette herself did not use Lourdes water for her own ailments, but sought relief at the nearby spa instead. God works in different ways as He sees fit, and it would be foolish to attempt to impose limits on His mercy, but Orthodox Christians themselves do not need to seek healing outside the Church. We have always known wonderworkers and healers. Staretz Amvrosy, mentioned earlier, was a healer, as were countless others, and innumerable healings continue to take place at the intercession of the Mother of God, for instance through her Tinos and Malevi icons, and at the intercession of St Xenia of Petersburg, and of St John (Maximovitch) of Shanghai and San Francisco. Many non-Orthodox would be very surprised if they knew how often healing of the body is mentioned together with the healing of the soul in the Church's prayers. In the prayers of Preparation and Thanksgiving for Holy Communion particularly, we pray repeatedly for "the healing and purification and enlightenment and protection and salvation and sanctification of soul and body," and for the Divine Grace to fill our five senses, joints and bones, as well as our mind, soul and affections. Likewise, the service of Holy Unction has never been kept solely for the dying, but is held on the eve of Christmas and on the Wednesday in Holy Week, when all the faithful are anointed, and anyone may request a service at any time in case of need. Some people emphasize the great compassion shown for the sick at Lourdes, and the time and energy spent on their behalf year after year by devoted helpers, and feel that the visions must be true if so much good comes from them. But compassion is not a solely Christian prerogative. Compassion to every living creature is the hallmark of Buddhism, and plenty of people of all faiths and none are quietly doing unpublicized voluntary work in hospitals or among the mentally and physically disabled in their neighbourhoods. The healings and compassion are not proof of the authenticity of the apparitions. That cures take place is not in doubt, but the exact nature of a cure may vary from case to case, and since both Protestant and spiritist bodies also show tangible results, it would be unwise to accept unreservedly the religious implications of cures at the Marian shrines and invest them with an interpretation that they cannot logically be made to bear. As the apparitions have been manipulated by various interested parties for the purposes of Roman Catholic propaganda, proselytism, nationalism and commercialism, so they are eagerly taken up by supporters of ecumenism. Anglicans, Lutherans, even Orthodox all visit the shrines. "The Madonna is for everyone." Or, "Come into my parlour, said the spider to the fly"? Just as the Pope has spoken of the "conversion of Russia" under one shepherd, "the successor to St Peter," so the Vatican's unchanging reunion plan for the rest of us is an open secret—subjection to the Roman Pontiff. At the same time, ecumenism beyond Christianity continues to gather pace in "the dialogue with non-Christian religions," although honest dialogue does not appear to be what the WCC has in mind. "The great religious communities will not disappear…. Jews will remain Jews, Moslems will remain Moslems, and those belonging to the great oriental religions will remain Hindus, Buddhists and Taoists"—yet somehow everyone, still keeping to his errors and rejecting Christ, "will abide in the Kingdom of God without ... having first become Christians like us." God cannot be contained, and He is the source of whatever truth is present in other faiths, but as C. S. Lewis pointed out, being a Christian does mean thinking that where Christianity differs from other religions, Christianity is right and they are wrong. He used the illustration of a sum—there is only one right answer to a sum, and all other answers are wrong, but some of the wrong answers are much nearer being right than others. Marian ecumenists believe that the Virgin is bringing an ecumenical message at Zeitoun and Medjugorje and that as mother of the entire human family she has a special role to play as a centre of unity and reconciler of quarrelsome children, so to speak. They point out that at Zeitoun the Mother of God remained silent. This is interpreted as a gesture of motherly tact and an invitation "to everyone present, regardless of their beliefs, to unite in God through prayer" (which is now quite normal at meetings for "dialogue with non-Christian religions" and in keeping with the ideas of the WCC). Had she declared herself to be the Mother of God, the Moslems would have rejected the vision; and had she identified herself as the Immaculate Conception, the Copts would have rejected it. They emphasize that the Virgin is mentioned in the Koran as the chosen of Allah and her purity and virtue extolled, but they omit to follow this by stating that Christ Himself is regarded as no more than one prophet among others—and inferior to Mahommed—and that His Crucifixion and Resurrection are utterly rejected. An Anglican correspondent for the Eastern Churches Review described his visit to Zeitoun in the Spring 1970 edition. He related the story of a leading Moslem who lived near the church and used to throw stones at the pilgrims. The Virgin appeared to him, requested that the stone-throwing cease, and ordered him to paint the cross on his house. This convinced him of the authenticity of the visions and he painted forty large white crosses all over the walls of his house. Somehow this seems a rather pointless exercise, as the man remained a practising Moslem and did not turn to Christ, Who seems not to have been actually mentioned and who, as usual, seems strangely absent from the proceedings. At Medjugorje the Virgin announced that she had come to "convert and reconcile." The shrine is seen as a possible key to peace in the region as only the "Gospa" can reconcile Catholics, Orthodox and Moslems, since they all reverence her. Once again we encounter this extraordinary idea of reconciliation and unity without Christ. The Gospa has chided Catholics of the region for mocking their Orthodox and Moslem neighbours, although this has not curbed anti-Serb propaganda in some of the books about the Medjugode apparition. She has declared that "basically religions are similar," which sounds very much like the teaching of Swami Vivekananda, the late nineteenth, early twentieth century Hindu missionary to the West, who said that all religions are the same at heart. The foundation and heart of Christianity is the Holy Trinity and the Resurrection of the God-man Jesus Christ. Judaism and Islam also believe in a God who requires men to live in a "good" way and oppose "evil," while Hinduism, as far as I can understand it, believes that God is beyond "good" and "evil," that everything in this world is part of God, that if only we could see things from the divine point of view, we should see that things we call bad from our own limited human viewpoint are also "God." Swami Vivekananda, speaking of the goddess Kali, the Terrible Mother, who unites opposites within herself—life and death , creation and destruction, mercy and terror—said, "Who can say that God does not manifest Himself as Evil as well as Good? But only the Hindu dares worship Him as the Evil." All religions share some things in common, but there are fundamental differences. The Gospa has also said that the Pope is to be a father to all people, not just to Catholics. Pope John Paul II, who is said to believe in the apparitions, seems to have taken her sayings to heart and made them the inspiration for further ecumenical moves. Apart from his Assissi World Day of Prayer, he refers to the Jews as the older brothers of Christians, and in his speech to young Moslems in Morocco, referred to the Father God sixty-six times. This in addition to the Vatican "missionary campaign" in Russia and the Ukraine, and Vatican interference in the Balkans, in Croatia, Bosnia and Skopje. The Pope apparently sees the third millennium as a new time for mission, a new era of faith, and has given his support to "Evangelization 2000," which has plans for world-wide evangelizing activity, with Europe, West and East, a priority. All these are "signs that indicate not only the gathering of Christians, but the embracing of all faiths and cultures within a common human identity before God" (Dudley Plunkett: Queen of Prophets). Archbishop Frane Franic of Split says, "... I especially see the importance of the role of Medjugorje in the ecumenical work of the Church." Might it be that the visionaries of Medjugorje are being used (albeit unconsciously) as part of a much wider softening-up process to prepare the way for the setting-up of a universal world religion in preparation for the coming of the Anti-Christ? It is, after all, of the essence of subtle demonic deceit to make things appear good and Christ-like, to present the kingdom of satan as if it were the Kingdom of Christ. The eighteenth century Anglican divine, Samuel Horsley, would grieve to see his words coming true today: "The Church of God on earth will be greatly reduced ... in the time of Anti-Christ, by the open desertion of the powers of the world. This desertion will begin in a professed indifference to any particular form of Christianity, under the form of universal toleration ... from toleration of the most pestilential heresies, they will proceed to toleration of Mahometanism and Atheism, and at last to the positive persecution of the truth of Christianity." Meanwhile, the earlier fifteenth century Cardinal Nicholas of Cusa would rejoice at the prospect of his vision in which he saw "warring sects permanently reconciled in a vast system of religious unity," wherein "pagan and Christian are jumbled up in a remarkable order, ... a Greek, an Italian, a Hindu, an Arab, a Chaldean, a Jew, a Scythian, a Persian, a Syrian, a Spaniard, a Tartar, a German, a Bohemian, and finally an Englishman," because "each system possesses a certain degree of truth" and "only through a study of the various systems can one have an inkling of the 'unity of the unattainable truth'." If there is an Anti-Christ aspect at Medjugorje, it would fit in well with an increasing interest in signs and wonders. The supernatural has been largely removed from life by rationalism, materialism and intimidation by science and technology. An increasing number who feel this lack have tried to fill the gap with UFOs, dancing suns, drugs, "faith" healing, charismatic revivalism, spiritism, New Age paganism, even satanism—and apparitions. Superstition continues to flourish. A statue of the Virgin weeps blood from one eye, and the neighbours pour in to recite the rosary before it. (In the opinion of the manufacturers, the resin used to fix the eyes had probably melted—quite a frequent occurrence.) A Mexican woman fries a tortilla for her husband's supper, sees it take on a resemblance to the face of Christ crowned with thorns, and a miracle has taken place! Over the following twelve months, 8,000 people have venerated the batter, encased in glass and surrounded by flowers and candles, while an embarrassed Archbishop tries in vain to halt the holy pancake cult. Thousands of people make a sober claim to having had their lives spiritually transformed by the shrines. Traditionalist Catholics, especially Marians, see the shrines as confirmation of their faith. Waverers who have been shaken by modern liberal changes in Catholicism seek and find reassurance. Liturgical innovationists feel free to indulge in services with "increased amounts of spontaneity and informality," such as the Party Mass for sick children at Lourdes, where following the consecration, balloons and streamers filled the air, and the celebrants joined hands and skipped up the aisle singing "Lord of the Dance" (actually the Hindu god Siva). Some nuns continue to live the old life, but most of the Sisters of Charity of Nevers (Bernadette's order) have put aside the religious habit and become part of the modern world. Even Bernadette herself has been manipulated by different groups who claim her as their heroine—the "revolutionaries" of Christ the Worker, because she was poor, working-class and generally disadvantaged; the "charismatics" because she had visions and heard the voice of heaven directly, apart from the official hierarchy. Spiritual power-houses, places of hope and healing, an outlet for superstition, a paradise for petty thieves (according to Patrick Marnham, a large plain-clothes police is required at Lourdes in high season) and commercial exploiters, a boost for tourism, an excuse for nationalism and proselytism, a way of satisfying the recurrent popular demand for the Goddess under a respectable Christian guise—the Shrines seem to be many things to many people. I conclude as I began by emphasizing that this a purely personal view of the apparition events. That one or more of the factors considered has played some part in each case I have no doubt, but beyond that I will not venture. Everyone is entitled to his or her own opinion, to accept or reject the apparitions, to visit the shrines or to stay away, but any Orthodox who might consider seeking healing at these shrines or going on pilgrimage there to honour the Mother of God, should, I believe, give very careful consideration indeed to what these places are all about. The Russian Orthodox priest, Fr Sergius Bulgakov, after his own pilgrimage to Lourdes, wrote: "The remembrance of this place embalmed by the presence invisible to our eyes, but clearly perceptible to our souls, of the most holy Mother of God, ...will remain among the dearest memories of our lives. At least in our hearts the interior dividing wall which separates us from the Roman Church has lost much of its opaqueness." Everyone's experience is his own, but this should be balanced by that of the Roman Catholic Robert Hugh Benson, quoted earlier, who experienced the dark side of the Lady of the Grotto. It should, perhaps, also be borne in mind that Fr Sergius' sophiology, considered very suspect by Orthodox theologians like St John (Maximovitch), may have affected his experience—"the Holy Spirit is manifest through the Virgin Mary—she is a creature but also no longer a creature." Contrary to what some Orthodox, including priests, have been led to believe, there is no Orthodox chapel at Lourdes. It is not obligatory for Roman Catholics to accept the apparitions even when their church has approved them, although some Marianists would like this changed, saying that official approval goes beyond permission to believe and involves infallibility. After a great deal of serious thought, I am unable to accept a divine origin for any of the apparitions (although some may very well be supernatural in origin), or to believe that God is speaking to the world through them. As an Orthodox, they seem to me unnecessary. We have the Scriptures, the teaching of the Church and the accumulated spiritual wisdom of 2,000 years to guide us. Above all, we have the Holy Spirit as the Pilot and Guide of the Church, and the Lord Jesus Christ as the ever-present and only Head of the Church. With the exception of Zeitoun, the apparitions have all appeared within a church which has pushed the God-man back into heaven and appointed a man as His infallible vicar on earth, a man whose position and power are reinforced and extended by these visions. The great Serbian theologian, [Archimandrite] Justin Popovich [of Blessed Memory], commented: "Vicarius Christi—what tragic illogic: to appoint a vicar and representative for the omnipotent God and Lord." For me, there are simply too many visions. The psychologist Staehkin, mentioned earlier, investigated over thirty sets of apparitions of the Virgin, involving three hundred appearances, between 1930-1950. Apart from the Miraculous Medal, which seemed to spark the whole thing off, and the apparitions already mentioned, we have also had Akita, in Japan (where a nun saw sheets of light in her cell and had over a hundred visions in which a statue of the Virgin spoke, wept, and bled), Rwanda, Argentina, Nicaragua, Venezuela, Korea, Hungary, Belgium, Holland, the USA, China, Syria, the Philippines, Italy and Ireland. Forty-seven other visionaries appeared outside Medjugorje in other parishes in the Mostar diocese. It is not the experiences that are in doubt, but the origin of the experiences, as visions may be caused by various psychological factors, natural psychic and mediumistic ability or demonic delusion. The demons do not hesitate to make full of our fallen intellects, false assumptions, spiritual pride, and psychologically based delusions, which is why the Church warns us, through the ascetics and great spiritual fathers, to be spiritually sober and constantly aware, lest self-deception turns into demonic deception. There are too many solar signs. Ever since Fatima, solar phenomena have been a feature at most of the shrines—lights, fires, rainbows, dancing suns, showers of petals, fiery crosses, with a particularly dramatic display at Zeitoun. When to these are added the Protestant Revivalist signs—pillars of fire, "Christ" in the sky, clouds that follow evangelists and shelter them from heat, and all the earlier UFOs, one cannot help wondering if there is a programme afoot purposely geared to cater for a generation that seeks after signs—the demons obligingly providing what we are ready to receive. One or two visions and signs might be convincing, but not literally hundreds. The apparitions are too public. Private revelations are one thing, but most of these apparitions have taken place amid a surfeit of publicity. The "heavenly" visitor comes with a global message and the visions frequently take place in front of crowds of spectators. The visionaries have frequently been the centre of a most unhealthy amount of interests and adulation. The Grotto at Lourdes was filled with police, the police commissioner, the mayor, his deputy, and crowds of up to 20,000. Bernadette was constantly taken from lessons for questioning, waylaid in the street and pestered by the crowds which besieged her home, anxious to catch a glimpse of her and ask for keepsakes and prayers. Similar crowds followed the Fatima children, kneeling to them and begging them to enter their homes and pray for sick relatives. Even Lucia's plaits were snipped off in the crush by relic hunters. The Zeltoun visions were seen by millions, believers and unbelievers alike. Amid the full glare of modern publicity, the Medjugorje visionaries quickly became the centre of world-wide attention, giving advice to those who crowded to their homes and relaying answers from the Lady of Medjugorje in response to questions from the crowd. They have been interviewed endlessly and investigated by doctors and psychologists. The Medjugore events have been promoted by an efficient and aggressive propaganda campaign using every possible means: printing presses dealing solely with the events, international dial-a-numbers for those wishing to receive the Gospa's monthly message, world-wide radio and TV programmes and lectures, videos, cassettes, and numerous books. (The mariologist Rene Laurentin alone has written at least ten.) One of the visionaries is co-author of a book, A Thousand Encounters with Our Lady in Medjugorje; another, via the American Ambassador to the European Community, wrote to Ronald Reagan and Mikhail Gorbachev (Reagan replied). There are special Medjugorje Centres across the world. And all this before any official decision on the apparitions has been reached by the appropriate ecclesiastical authorities. It seems doubtful whether any commission will finally be prepared to give a negative verdict in view of the highly successful propaganda and the degree of popular religious enthusiasm, especially as the Pope has said he thinks there is nothing but good at Medjugorje. While reading about the Medjugorje events I was struck by certain similarities with the Charismatic Movement, especially in the messages and attitude of the supporters, so it came as no surprise to find that almost from the beginning the events of Medjugorje were in the hands of charismatic people: Friar Jozo Zovko, Friar Tomislav Vlasic and others, or to learn that "In May 1981, an international conference for the leaders of the Charismatic Movement took place in Rome. One of the leaders present from Yugoslavia was Fr Tomislav Vlasic.... One of the leaders praying with him, Sister Briege McKenna, had a mental vision of Fr Vlasic sitting down surrounded by a big crowd: a stream of water was flowing from the chair. Emile Tardif, O.P, said as a prophesy, 'Don't worry, I am sending you my Mother.' And so Fr Vlasic returned to Yugoslavia. Two weeks after his return, Our Lady started to appear to a group of boys and girls in the Franciscan parish of Medjugorje. New Life was flowing." The Father Vlasic mentioned was the spiritual guide, interpreter and protector of the visionaries for three years. To some he is "a man of irreproachable sanctity," to others "a Charismatic magician." There is the same incredible ease with which the visionaries accept their apparitions and the charismatics accept their "gifts of the Spirit" as coming from God. Something that is not mere hallucination, but is outside the limits of human knowledge and experience, is still not necessarily a genuine, grace-given vision. It can be simply a trust in pleasant psychic experiences. There is also the same emphasis on "love" and "peace" and "joy" in the messages. Here there would appear to be similarities with another phenomenon spiritism. Mediums do not hesitate to accept their spirit guides as Messengers of Light, and their messages, too, are invariably loving and consoling, usually reverent, with frequent references to a Deity, and with moral teaching. Mediums claim to convey messages from a higher world. The visionaries have conveyed messages from the Gospa to those who have sought answers through them. Even the Archbishop of Split asked one of the visionaries if she could ask the Gospa if there was any message for him. A charismatic, speaking of the prophesies in her American meeting, says, "The messages have always been those of great solace and joy from the Lord." A Medjugorje supporter, speaking of the Gospa's messages, says, "The messages are a mine of beautiful counsels and reassurances." "I reach out my hand to you. You need only take it and I will lead you" (Charismatic). "Today I want to wrap my mantle around you and lead you all along the road to conversion" (Gospa). "Be like a tree, swaying with his will, rooted in his strength, reaching up to his love and light" (Charismatic). "Open your hearts to God like the flowers in the Spring yearning for the sun" (Gospa). Obviously the healing services at Fr Jozo Zovko's church, mentioned earlier, were charismatic ones, which explains why the people fell about embracing, weeping and fainting. Fr Jozo's ministry now includes Resting in the Spirit—a less dramatic version of the Pentecostal / Charismatic Slaying in the Spirit—to which he was introduced by an American, and which has apparently caused "some embarrassment" in the parish. Conflict with the Franciscans in Hercegovina stretched back to Turkish times, when the friars continued to minister to the Catholics in the absence of a bishop. In 1881 a regular hierarchy was reestablished, the intention of the Holy See being that secular clergy would gradually replace the Franciscans in charge of parishes. This caused deep resentment and tension between the friars and the people on the one hand and the diocesan authorities on the other. Medjugorje remained a Franciscan parish. Dr Zanic, the Bishop of Mostar at the time of the apparition beginnings, continued to implement this policy in the face of widespread opposition. Two friars openly rebelled and were jointly suspended by the bishop and expelled from their order by their own superiors. The two friars promptly enlisted the help of the visionaries who referred the matter to the Lady of Medjugorje on no less than thirteen occasions. She came down firmly on the side of the two friars innocent, blameless, and punished in this way! ... The Bishop does not act according to the will of God ... The Bishop has been hasty ... The Bishop is guilty." "She (the Gospa) spoke about this (Hercegovina) case and burst our laughing and said that she alone would sort out everything. Then she began to laugh. Then Jakov and I had fits of laughter..." "If he (the Bishop) doesn't accept these events (the authenticity of the apparitions) and behave properly, he will hear my judgement and the judgement of my Son." The Bishop (and others) remained sceptical, calling the whole thing a deceit and swindle and claiming that a group of friars led by Fr Tomislav Vlasic were exploiting the "Visionaries" for their own ends. The supporters see in Medjugorje a great stirring of religious renewal and are wildly enthusiastic, while others, both clergy and laity, even families from the village remain indifferent or opposed. The supporters bring out the usual argument, the same one used for all shrines, as well as by heretics of the past, and the charismatics, both Catholic and Protestant, today. "By their fruits ye shall known them." They ask how Satan can be at work when the vision emphasizes prayer and fasting, and when there are conversions and healings. Dr Franic, Archbishop of Split, uses this argument in a letter to Rome in 1985, writing: "For the last three and a half years over three million pilgrims have come to Medjugorje, from all five continents, and all, after the pilgrimage, have returned home converted or brought back to the Christian life from religious indifference or from absolute atheism, renewing contact with prayer and religious practices like fasting, generally on Friday, and in some homes also on Wednesday, their food consisting of bread and water, in a word completely reconciled with God and men." That most returned home in a state of temporary euphoria is very likely; that some, perhaps a good many, began to live a more serious Christian life and came face to face with Christ for the first time is certainly possible, but that all three million—if there were three million to start with—were completely reconciled to God and men would indeed be a miracle, the miracle of Medjugorje, but it is much more likely to be wishful thinking on the Archbishop's part. We only have to recall the Parable of the Pharisee and the Publican to know that prayer and fasting or any other "religious practice" are not sufficient in themselves to reconcile us to God and men. Healings, as we know, occur in many places other than Marian shrines, also in non-Christian religions. Healing, like the numbers of pilgrims, has been cause for dissension, with opponents claiming that there is no proof for many of the healings, that the Medical Bureau at Lourdes gave a negative response, and that some of those claimed as "healed" had in fact died. At one pilgrimage, the Bishop of Mostar declared there were only 30,000 pilgrims as against Fr Vlasic's possible 200,000. The visionaries asked "Our Lady of Medjugorje" for the precise number. She replied 110,000. There are also rotten fruits—the disagreements with devotees of other Marian shrines (echoes of Our Lady of Walsingham versus Our Lady of Ipswich), and another sorry saga of dog-collar-eat-dog-collar, again with exceedingly acrimonious exchanges at high levels. On a lighter note, Desmond Seward (The Dancing Sun) gives us an amusing account of the lengthy sermon at an English mass by a priest from Kentucky, which included a moving account of his agonies in giving up Coca-Cola after he had responded to the Virgin's call to do penance. How convincing are the visionaries themselves, who all believe that they have seen the Mother of God? A real cause for concern is what would appear to be an extraordinary lack of spiritual caution, resulting in unquestioning acceptance of their visions as indeed the Blessed Virgin. Recall the words of one Medjugorje visionary—"Who else could it be? It was obvious!" Zeitoun stands out as a different from the other apparitions because, as mentioned earlier, the figure was seen over three years by senior members of the Coptic clergy, Catholics, Protestants, Moslems, Jews and atheists. Had it not been for the striking similarity between the descriptions of the Zeitoun solar phenomena and the earlier descriptions of UFOs, I would have found this group of witnesses solid and impressive, although it would still have been difficult to see why the Virgin should appear in this public way to all and sundry, when Christ Himself never took the opportunity to convince unbelievers by appearing over Jerusalem, where He could have been seen by Pilate, Herod, Calaphas, and all the people, as proof of His Resurrection. Catherine Laboure, who saw the Miraculous Medal, was a lover of visions, and embarked on the unwise (in Orthodox eyes, exceedingly dangerous) course of seeking more visions. Knowing how the demons can deceive us, the ascetics always spurned visions, saying that they were unworthy to see angels. The Miraculous Medal prayer proved excellent propaganda material for the Immaculate Conception dogma, and Catherine died knowing that millions of medals had been distributed throughout the world. Her own identity, which was supposed to have been kept a secret, was somehow discovered, and she was canonized by the Roman church. Maximin and Melanie of La Salette seem to have been an unprepossessing pair as children, and their adult lives were not very reassuring either. Bishop Doupanloup found Maximin "disgusting in every way," and the cure d'Ars, who also interviewed him said, "If what the child tells me is true, one cannot believe in it." However, the voice of popular enthusiasm prevailed and the official conclusion was in favour of the apparition. Bernadette comes across as refreshingly normal, with plenty of rough peasant wit and commonsense. After entering a convent she had no further visions and did nothing to draw attention to herself or engineer the fame she was to acquire. Her physical illnesses were suffered courageously and borne with dignity. She apparently believed that she had never willed to do anything wrong in her life, and she also believed that she had never [previously] heard the words "Immaculate Conception." The latter is almost impossible to accept because the people of the Pyrenees had been celebrating the Feast of the Immaculate Conception as a holy day of obligation for the previous one hundred and fifty years, that is, since the decree of Clement XI in 1708. (Plus IX merely defined the dogma and imposed it as an article of faith.) Throughout her Catholic childhood in a Catholic culture, Bernadette would have been taken to church on 8th December, just as she would have gone at Christmas, Easter and the Assumption. After the definition of the dogma in 1854, and in connection with the popular Miraculous Medal, with its prayer to "Mary conceived without sin," the Immaculate Conception must have been referred to countless times in her hearing. The small seers of Fatima were paragons of virtue according to Sister Lucia, the surviving visionary, with a chillingly unnatural brand of piety. They wore ropes round their waists, next to the skin, until their Lady assured them that God did not wish them to sleep with the ropes on, but only to wear them during the day. They mortified themselves in every possible way, at times refusing food and drink, and deliberately stinging themselves with nettles, and they made a sacrifice of absolutely everything, saying each time the words the Lady had taught them: "O Jesus, it is for love of You, for the conversion of sinners, and in reparation for the sins committed against the Immaculate Heart of Mary." The two younger seers both died in childhood; Lucia continued to receive visions and revelations as a nun. Marlette Beco, a Belgian girl, was visited eight times in 1933 by an apparition who bore an uncanny resemblance to the Lady of Lourdes, who likewise asked for a chapel, produced a spring, and gave the child a secret. Marie was eleven years old, at an emotional pre-adolescent age, and was frequently reduced to tears on account of the apparitions, crying during some of the visions and "weeping uncontrollably at the non-appearance of her Lady" on evenings when nothing happened, and feeling ill and tired and fainting, although the doctor declared that there was nothing physically wrong with her. At the end of the final apparition, at the departure of the "Virgin of the Poor," the girl "flung herself to the soggy ground where she lay in a crumpled heap, hiccuping and sobbing convulsively, while attempting to say her prayers." Marlette Beco was recognized by the ecclesiastical authorities as having seen the Blessed Virgin, and Banneux blossomed into a pilgrimage centre with the usual parade style ground for blessing the sick, a hospital and camping area. A society of Banneux organizes pilgrimages and disseminates information. The young people of Medjugorje have been described as living in an exalted spiritual world, shining examples who live "exemplary lives of prayer, fasting, detachment from the evil of their age and peers manifesting true love towards the Church and the Pope." They have also been called "little liars," "ignorant pawns in a game they do not understand," with "inflated egos" and behaving like "domesticated robots." One visionary, Mirjana, no longer sees the apparitions but instead hears an internal voice. Two other girls (other than the visionaries), Jelena and Marijana, initially under the direction of Fr Tomislav Vlasic—the charismatic leader who had been spiritual director to the visionaries—also hear an inner voice, which they believe to be the Virgin's, giving them personal messages, messages for the local prayer group, the parish and the world. Over a million copies have been distributed free of books by the same Fr Vlasic which contain meditations on the messages and include "formulae of consecration to the sacred Heart of Jesus and the Immaculate Heart of Mary, dictates by Our Lady to Jelena." Other priests associated with Medjugorje and the Charismatic Movement also receive "inner locutions," said to be an explicit internal awareness of a message unlike any human form of communication. Lest anyone should hesitate to accept the apparitions on account of their doubts about the visionaries, they need not worry, Rome has the answer. A special category of divine favours to cover unsatisfactory visionaries—"gratiae gratis datae"—favours given by God with no regard to the spiritual state of the visionary. The Mother of God or the Goddess? Who is this Lady who has appeared thousands of times and is acclaimed by millions'? Is she the Mother of God, whom we know within Orthodoxy from the Scriptures and the services and teachings of the Church? It is almost as if the Marian apparition cult has a life and ethos of its own, almost as if it were a separate religion—Christianity overlaid with the worship of the Goddess and spiritism. The Virgin, not Christ, is the central figure. Heaven speaks through her, not Him. Despite Rome's official teaching, which still precludes placing Mary on a level with her Son, she is predominant. Geoffrey Ashe seems to have put his finger on it when he says that "the vitality of Christ's own (R.C.!) Church has often seemed to depend on her rather than on Him." My sense of the autonomous Virgin, acting in her own right, was confirmed by Fr Michael O'Carroll, who says that God has chosen to entrust His mission of mercy and renewal to the Blessed Virgin Mary. Speaking of Medjugorje, he says, "It was not God the Father, nor God the Son incarnate, nor God the Holy Spirit who took the initiative at Medjugorje. It was Our Lady." He goes on to say that the main feature of Medjugorje is the manifestation of the "dominant, continuing, utterly self-assured role given to Our Lady." He seeks to reassure those who feel that God has been displaced at Medjugorje by speaking of the Gospa's "recurring mention of the Holy Spirit." In the two hundred and three messages I read, the Holy Spirit was mentioned just six times, twice in a way that made Him merely a witness to the Gospa—"I am inviting you, dear children, to pray for the gifts of the Holy Spirit which you need so as to witness to my presence and all that I am giving you…. The Spirit of truth is necessary for you in order to convey the messages just as I give them to you." Fr O'Carroll's "assurance" is couched in terms that will sound very strange to Orthodox ears. "The recurring mention of the Holy Spirit is notable and accords well with the revival, within the last lifetime, of doctrine and devotion about him: he was always part of the Christian creed, accepted by believers, honoured in certain common prayers." He adds significantly, "But it is not so long since a spiritual work about him appeared with the title 'The Forgotten Paraclete,' or since a great master of the spiritual life, Dom Columba Marmion, could assert that for some the attitude would be that expressed in an important text in Acts: 'We have not even heard if there be a Holy Spirit."' This confirmed my earlier reference to the Latin filioque with its subsequent downgrading of the Holy Spirit, and the large part I believe this distortion of Trinitarian doctrine has played in the Marian apparitions. The need for the Eternal feminine lies deep in the human psyche. That need is met in the Holy Trinity, the heart of Orthodoxy. Where Trinitarian teaching is unbalanced, and the Holy Spirit neglected, the Goddess is likely to re-emerge either under the form of Marian excess, or in the guise of Gnosticism, with its demand for women priests and inclusive language for God. In the New Testament we see the incomparable spiritual beauty of the Mother of the Lord. In her shining humility she always points away from herself. Mother of the Messiah, she humbly refers to herself as God's handmaiden. Her kinswoman Elizabeth's praise of her is immediately referred to God, Who has regarded her lowliness. She does not presume to issue her own orders to the servants at Cana, but quietly advises them to obey her Son's instructions. The Acts leaves her not engaged in some private initiative, but waiting in prayer with the whole body of the believers. The lady of all the apparitions, by contrast, remains firmly centre stage, with the spotlight fixed permanently on herself. She decrees new titles for herself: The Immaculate Conception, Our Lady of the Rosary, Mother of Consolation, Virgin of the Poor, Queen of Peace. She seeks amendment and consolation for injuries done to herself:—"Dry the tears on my face, which I pour down as I observe what you do" (Medjugorje), "Look at my Heart, surrounded with thorns with which ungrateful men pierce me at every moment by their blasphemies and ingratitude. There are so many souls whom the Justice of God condemns for sins committed against me that I have come to ask for reparation: sacrifice yourself for this intention" (Fatima). In Goddess-language, the Lady of Medjugorje tells us, "I am tireless, I am calling you even when you are far from my heart. I am the Mother, and though I feel pain for everyone who goes astray, I forgive easily and I rejoice for every child who comes to me." She appeared on the mountain with five angels in 1986, declaring to the visionaries that what they were experiencing was "like the Transfiguration on Mt Tabor." She would give the people all the graces they needed. She blessed them and told them to "go down from Tabor and take the blessing to others." "Wherever I come, my Son is with me," she says. The truth is, that where the God-Man is, so also, in Him, His Mother, His saints, His angels and His righteous ones are present. In Him—and only in Him—we have fellowship with them and ask their help. His Mother is truly Mother of us all in the Church, where she holds the most exalted position, closest to Christ, but she does not act independently from Him. She is not the Mother of the Church, nor the Mediatrix of all graces, nor the Co-Redemptrix—both these latter titles being implicit throughout the Medjugorje messages. "Divorced from her setting in the Gospels and evolved from man's subconscious fancies, she may become anything, from a dream of sentiment to being dark, inscrutable, inexorable, akin to the gloomy goddesses of pagan thought" (Newbolt: The Blessed Virgin). In the end it must be the content of the messages themselves which inspires acceptance or rejection of the visions. As stated previously, this was why we have not included Walsingham among the Marian shrines, as the message, whether revealed to Richeldis in a private vision or a dream, was a simple request for a chapel in honour of the incarnation. At Zeitoun, and earlier at Knock, no message was given, so the purpose of those visions is a matter for conjecture. There are differences of emphasis in the still an underlying unity, although Lourdes messages at the various shrines, but still appears to be the odd one out in several ways. Firstly there is the air of politeness and courtesy. "Come nearer, children, don't be afraid: I am here to tell you great news," at La Salette. "Will you do me the kindness of coming here for a fortnight," at Lourdes The Lady of Zeitoun bows in greeting to the assembled crowds. The Gospa of Medjugorje repeats her parrotlike refrain at the end of every message, "Thank you for responding to my call." There is the same absence of Christ, or at least His marginalization as a distant figure of vengeance, whose just wrath is held back by the Virgin. 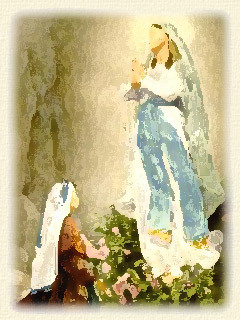 At Medjugorje He is equally distant, though not fearful, and we are invited to "think more about Jesus" on Christmas Day and "do something concrete for Jesus Christ,"—that is, "bring a flower as a sign of abandonment to Jesus. I want every member of the family to have one flower next to the crib so that Jesus can see and see your devotion to him." There are the same secrets, apocalyptic warnings, good advice on church going and behaviour, and exhortations to "love," "do penance," and "pray." The message of Banneux was quite literally, "Pray a lot." Prayer means the rosary, which is constantly mentioned. Although Medjugorje supporters claim that the Mass is emphasized as the central prayer, the rosary has general preeminence. It is "the one form of prayer preferred by Mary" (O'Carroll). "The rosary is a powerful weapon against Satan ... We must defeat Satan with rosaries in our hands ... " (Medjugorje). Assistance at the hour of death is promised at Fatima to those who confess, receive Communion on the first Saturday of five consecutive months and recite a set umber of rosaries for a set amount of times with the correct intention. All the visionaries have recited the rosary, and the apparition at Medjugorje appeared regularly during its public recitation. The boy seer of Fatima was given the promise that he would go to heaven but would "have to recite many rosaries." One of the Medjugorje visionaries received a rosary from the Lady personally (whether this was actually a materialization is not clear) and the Pope was sent one specially blessed for him by the Gospa. There is the same teaching of purgatory and Papal supremacy, and the same emphasis on the sacred Heart of Jesus and the Immaculate Heart of Mary. Pope John Paul II likewise emphasizes the Immaculate Heart and associates it with the sacred Heart. Those who embrace the Immaculate Heart are offered salvation at Fatima, and the Gospa of Medjugorje invites us to consecrate ourselves to the Immaculate Heart and make atonement for the sins by which the Heart of Jesus has been offended. There are the same bargains, promises and threats, inducements to right action through self-interest. If you do this, I promise to do that: if you omit to do so and so, such and such will follow or not follow. "Those who wear the Medal will receive great favours, especially if they wear it round their neck." "If sinners will only repent, the stones and rocks will turn into heaps of wheat" (La Salette). "If people do as I tell you, many souls will be saved and there will be peace" (Fatima). "If we do not change, the punishment will be very great" (Garabandal). Lourdes is in many ways a striking contrast. The rosary is as prominent, and the apparition holds a rosary on her arm and lets the beads slip through her fingers as Bernadette kneels and recites her prayers. But while there is no mention whatsoever of Christ, there is also no mention of Hearts, purgatory, apocalyptic threats or bargains. The utterances are few and concise, consisting in the main of short commandments: "Go and kiss the ground for the conversion of sinners; Go and drink at the spring ...; Go and tell the priests to have a chapel built here." The contrast with the garrulousness of the Gospa of Medjugorje could not be more marked. The vision's short statement, "I am the Immaculate Conception," has had a greater impact than any other message from the shrines. Protestants are inclined to see in it no more than a reflection of Bernadette's mental ability and the state of her grammar. Roman Catholic theologians at the time puzzled over it and felt uneasy because it was uncomfortably similar to Old and New Testament statements made by God and Christ, and seemed to parallel "I am the Resurrection," "I am the Way, the Truth, and the Life." Marian maximalists rejoiced at what they saw as divine honours given the Virgin in heaven, and hopefully awaited further revelations by future apparitions, saying, "I am the Mediation of all graces," and "I am the Co-Redemption." To their chagrin, they were disappointed, and had to make do with "I am the Lady of the Rosary" and "I am the Virgin of the Poor." Marian minimalists, on the other hand, insisted that the Virgin was purposely limiting her privileges to the Immaculate Conception and thereby implying that she was not the Mediatrix of all graces or Co-Redemptrix. Some Orthodox, in an attempt to justify their own acceptance of the Lourdes apparition, try to attach significance to the the date on which the statement was made, namely March 25th, saying that the Virgin was referring not to her own conception by St Anna, but to the (only) Immaculate Conception of the Lord Jesus Christ on the day of the Annunciation. The statement would seem to be as enigmatic as many from the Delphic oracle. What it did do was precipitate and confirm the dogma of Papal Infallibility. In imposing the dogma of the Immaculate Conception in 1854, the Pope acted on his own authority without the consent of a General Council. For this he was greatly criticised in some ecclesiastical circles. When the Lady of Lourdes announced her name by privilege as "I am the Immaculate Conception," she not only proved that the Pope had been right about the dogma, but confirmed his ability to act on his own, in other words that the supreme authority belonged to the Pope alone. Papal Infallibility became an official dogma in 1870. As Alan Neame puts it, Our Lady of Lourdes was to some degree the mother of Papal Infallibility and the grandmother of the Old Catholics who went into schism rather than accept it. If someone should inconveniently recall that [St] Catherine of Sienna [fourteenth century], during her vision, was told by Our Lady that she was not immaculately conceived, again, Rome has the answer. Even saintly people can misinterpret their revelations, and Catherine was so influenced by her Dominican teachers, who opposed the teaching, that "even in her mystical rapture this holy woman could not sufficiently immerse herself in God to overcome the suggestion" (Archbishop of Split). Unsatisfactory messages, then, are as easily disposed of as unsatisfactory visionaries. According to Dr Franic, Archbishop of Split, not only human suggestion but even evil spirits can easily infiltrate the messages, and therefore every message must be looked at separately. In effect, inconvenient messages can be deleted, leaving a laundered revelation. What with visionaries of doubtful reliability who may be entrusted with divine revelations, divine messages which may be misinterpreted by holy visionaries, or even twisted by evils spirit, and parapsychological causes which may be the sole origin of visions, it would seem that all is shifting ground and there is nothing that can be relied on. The new factor of the Medjugorje messages is the ecumenical one. The century of trial for the Church is coming to an end, and the Gospa has particularly prophesied an outburst of faith in Russia "where God will be more glorified than anywhere else." Link this with the Fatima pronouncement on Russia, the Hriushiw call to the Uniats to be missionaries to Russia, the Pope's keen interest in Russia and his support for Evangelisation 2000, with its emphasis on Europe West and East, and we cannot say we have not been warned! The Gospa has said that divisions in religion are man-made, and is also said to have declared that God commands in all religions as a king does in his realm, although I did not find this latter statement in the books I read, which is not surprising as the apparitions have been going on for so long, with hundreds of messages, that it would be impossible to include everything. Also, as Fr Rene Laurentin has noted in one of his articles, Rome has shown concern that some of the messages seemed to be implying religious indifference, and therefore it is quite likely that such a controversial statement would be suppressed in any publication favourable to the apparitions, since such an all-out ecumenist position is not (yet) generally acceptable. I wrote to the London Medjugorje Centre for clarification on this point but received no reply. It seems that some kind of unity without Christ is envisaged for non-Christian religions. For some time now Western ecumenists have been tentatively discussing the need for a possible revision or modification of the traditional Incarnational view whereby Christ is unique and final revelation of God to man, on the grounds that it is incompatible with inter-religious dialogue. Be that as it may, my impression from studying the messages from some of the shrines (Fatima, Zeitoun, Hriushiw, Medjugorje) and different writers' comments on them, is that the Pope is to be the symbol of unity for Christians, who will be reunited despite doctrinal differences (subjection to the Papacy without unity in the faith) and the father of people of all faiths and cultures (the new world religion). My initial reaction on reading the messages from the shrines was one of intense disappointment. They hardly seemed to justify a heavenly visitation. The messages from Medjugorje particularly seemed bland, banal, and boringly monotonous. And there were far too many of them. If God really was trying to speak, it would be almost impossible to hear Him for the Lady's incessant chattering. It was with a feeling of grateful wonder and tremendous joy and relief that I turned once more to the richness and depth of our Orthodox prayers. There are very few places in the Gospels where it is recorded that the Mother of God spoke, but each one of them is highly significant. One could spend a life-time meditating on her sayings and never exhaust their meaning. Otherwise she is silent in order that her Son, the Word, may speak. Nothing can ever surpass the holy Virgin's two sublime titles: her own choice—Handmaid of the Lord, and that which the Church has given her—Theotokos, Mother of God. Neither can anything of greater importance be added to her last recorded utterance, which remains an eternally true, relevant and universal message—"Whatsoever He saith unto you, do it." "I promise to assist at the hour of death with all the graces necessary for salvation all those who ... keep me company for a quarter of an hour while meditating on the mysteries of the Rosary with the intention of making reparation to me."